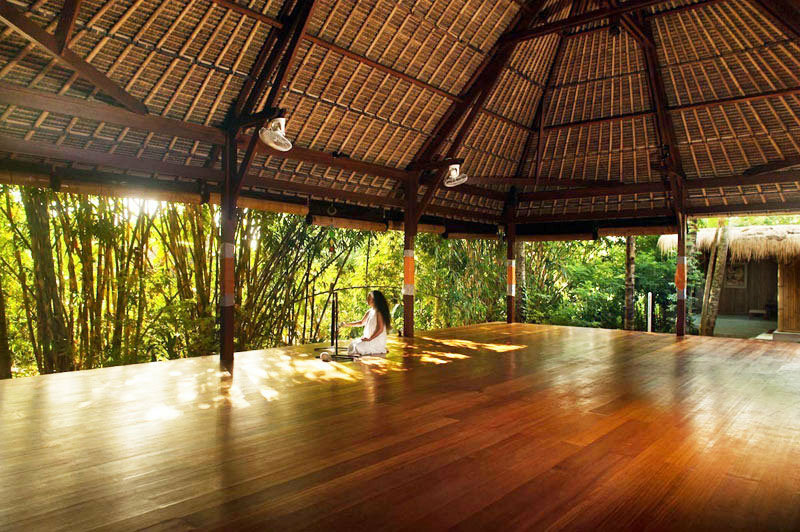 Indonesia > Bali > 19 Affordable yoga retreats in Bali where you can enjoy magnificent views while you reflect and relax! Ever imagined a holiday to Bali from which you return home feeling fitter and healthier than ever instead of eternally hungover? While rolling your mat in the comfort of your air-conditioned living room is a nice feeling, an even more delightful experience when you’re in a dire need for a break is when you get to practise yoga in a location that offers views that are bound to awaken your senses (and sure you’ll be able to touch your toes, finally!!). 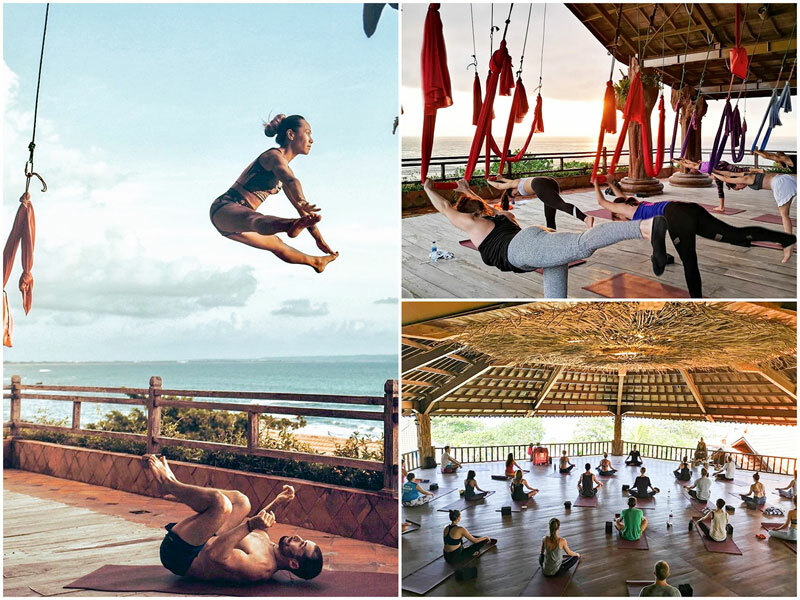 Whether you’re a seasoned veteran or just have a casual interest, you’ll gain so much when signing up for one of these affordable yoga retreats with a view in Bali. 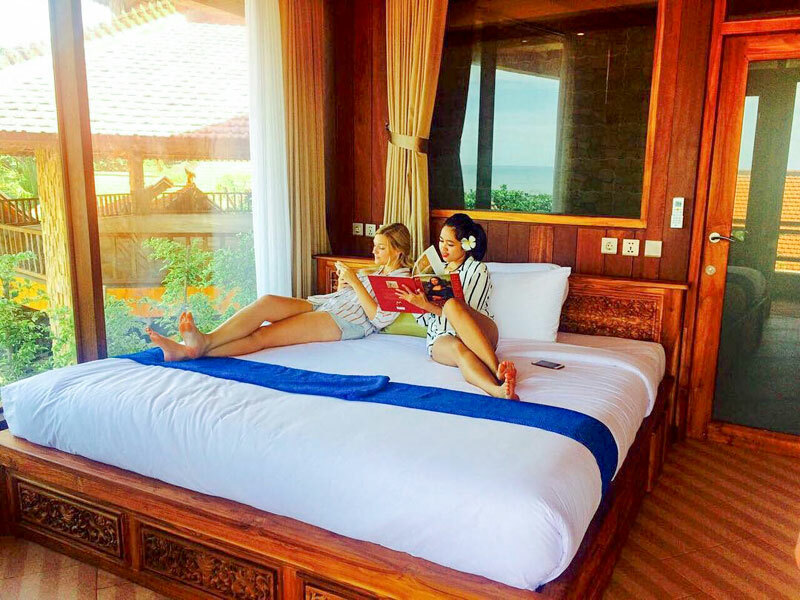 In here, you’ll find tranquillity in being near water and jungles while rejuvenating yourself with some Balinese sunshine too! Trust us, as we’ve experienced both conditions, it’s so therapeutic when practising amidst Mother Nature’s greatest wonders, as compared to your usual studio/gym/living room! Psst… time to pack your sexiest yoga pants! 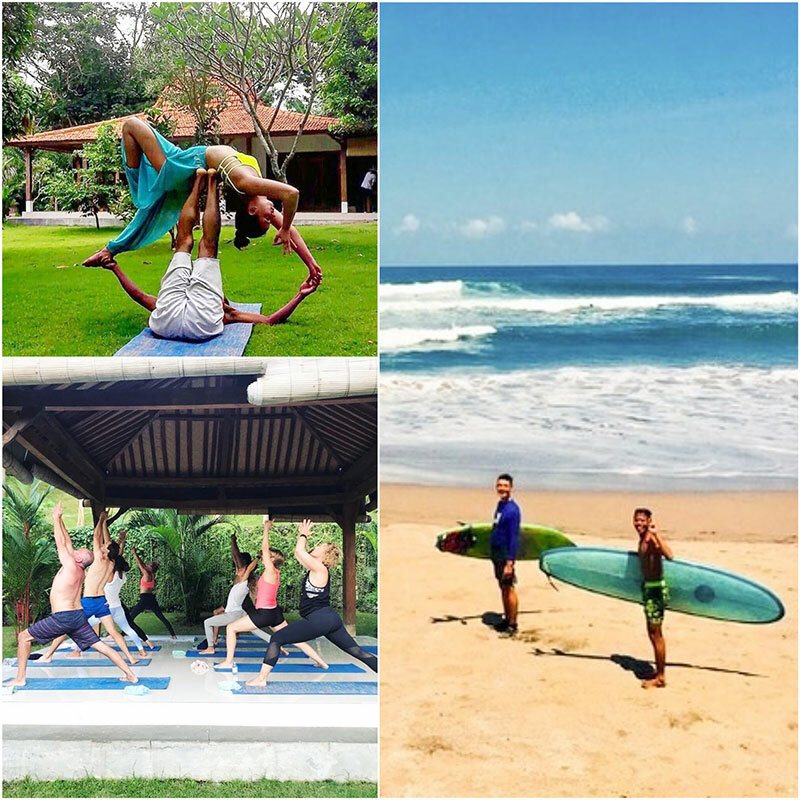 Yoga is a key offering alongside surf and meditation at this gorgeously crafted retreat hidden away in lively Canggu. 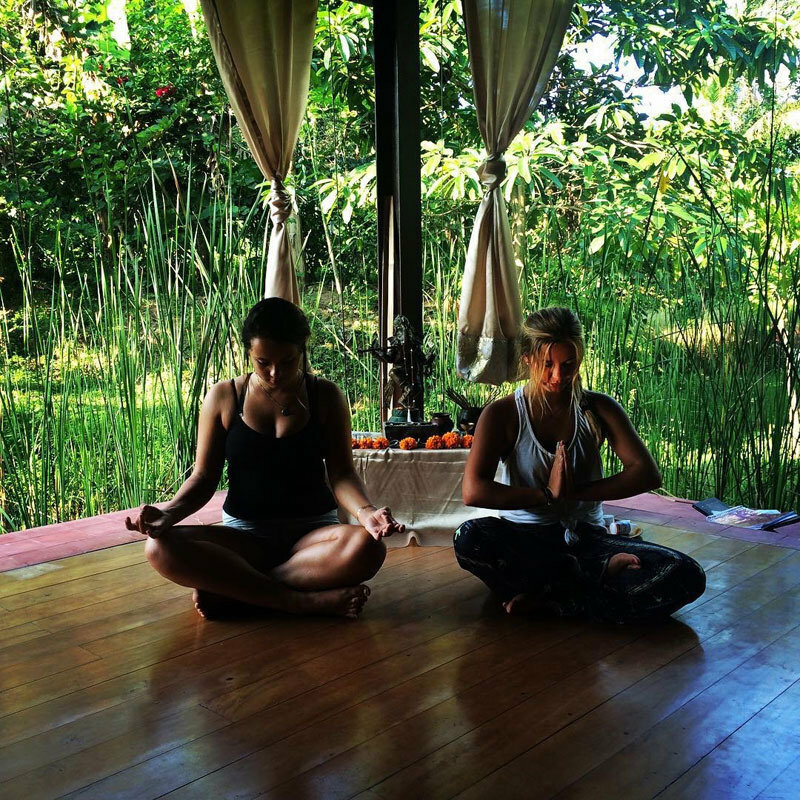 The holistic haven is a go-slow yoga retreat that is suitable for individuals of all levels. 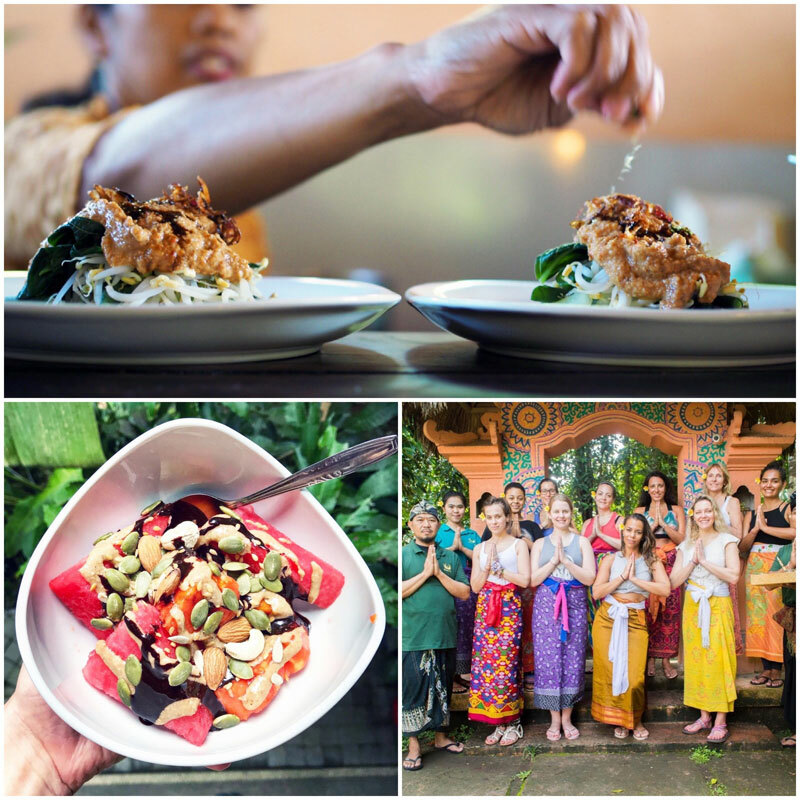 Booking a retreat at Pelan Pelan Bali means you sign up for a programme of minimum 7 nights, with healthy food, an active lifestyle and the healing energy of yoga and meditation sessions. 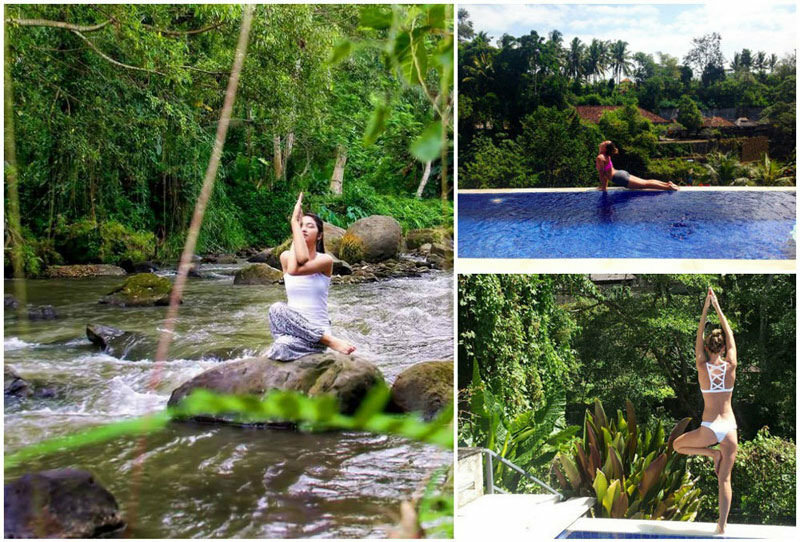 If you’re here to nail a tricky yoga position, think how amazing it is going to feel and look when you get to practise at their yoga shala located right next to the river and surrounded by Bali’s magnificent nature. Days here typically start with surfing and end with yoga but you get to choose between various packages, which include mind and body fulfilment with rejuvenating outdoor body massages. Perhaps, you’ll love some action by combining surfing lessons to your yoga retreat, as offered in their “Get It All” package. 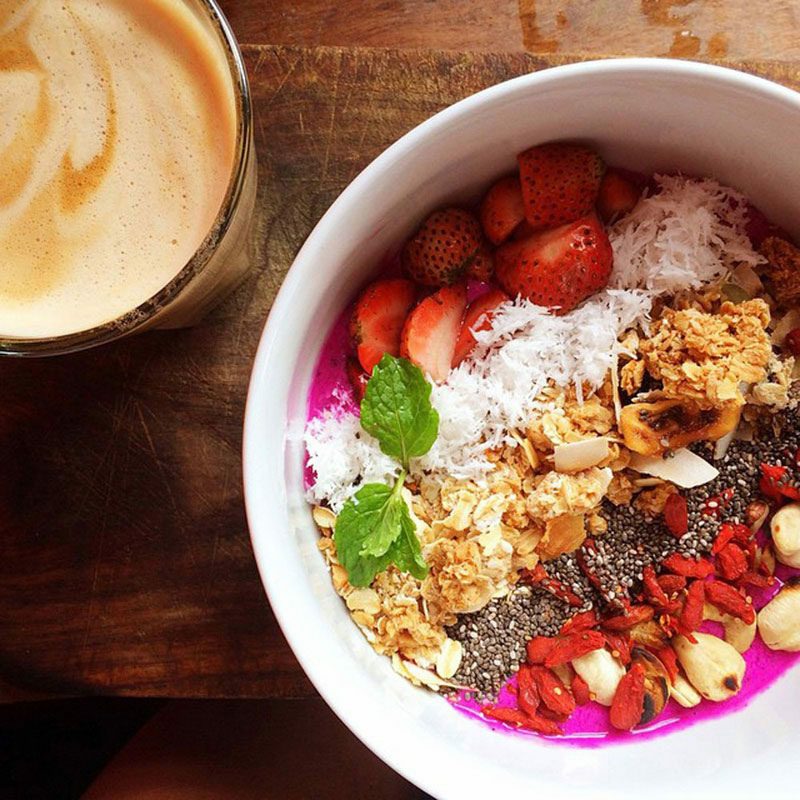 We recommend kicking off bright and early to choose from their four breakfast options with fruits and vegetables freshly brought from the local market as early as 4 am. For lunch, you get to indulge in delicious Indonesian cuisine. Since the focus is on wellness, diet options are catered for too. 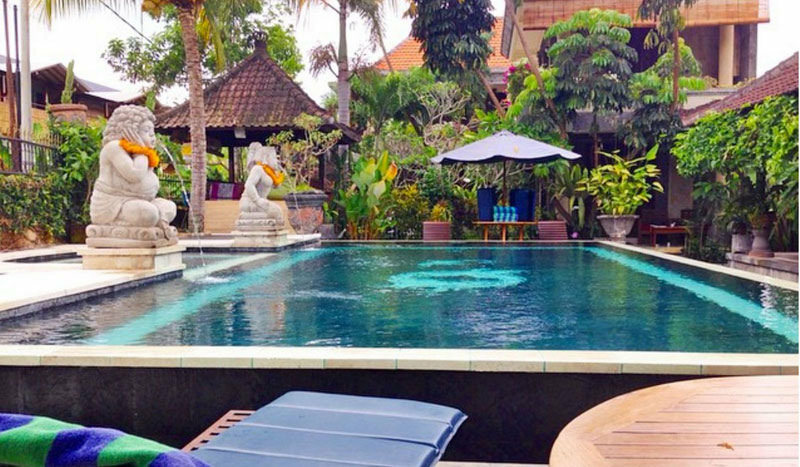 What’s more, you’ll find the most relaxing place to balance your dosha right in your room, from which you have access to a large outdoor swimming pool in the middle of a stunning Balinese garden on the river. The property also offers plenty of peaceful spaces to relax and master your lotus position or settle for a tranquil meditation moment. Trust us, you’ll want to nama-stay in! Book your peaceful retreat here! Book your peaceful retreat here! 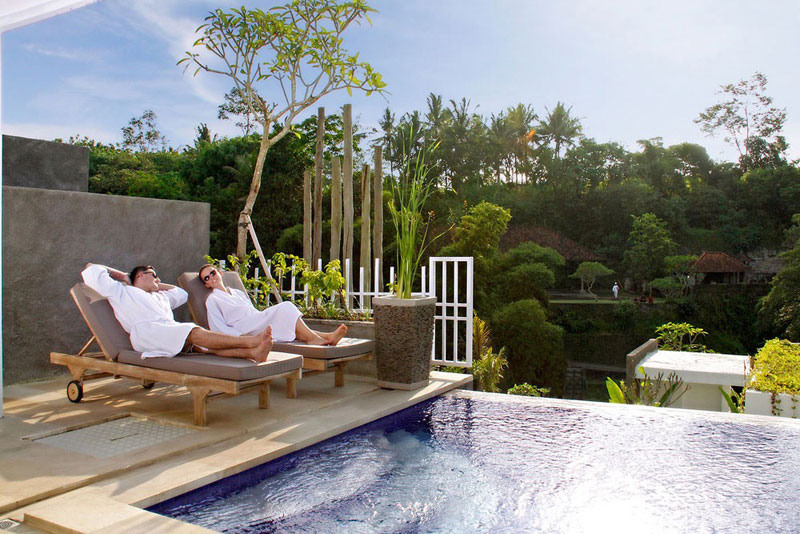 Nowhere else brings you that little extra zen in your life than Udara Bali. 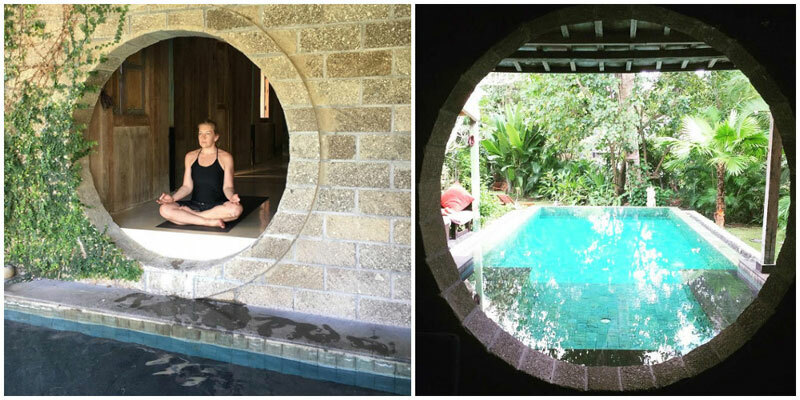 This exotic retreat is entirely dedicated to yoga and wellness. The location does not only help you destress but also experience a whole new culture as you settle in one of their three ocean-view yoga shalas, or opt for the one overlooking mystical ancient temples nearby. 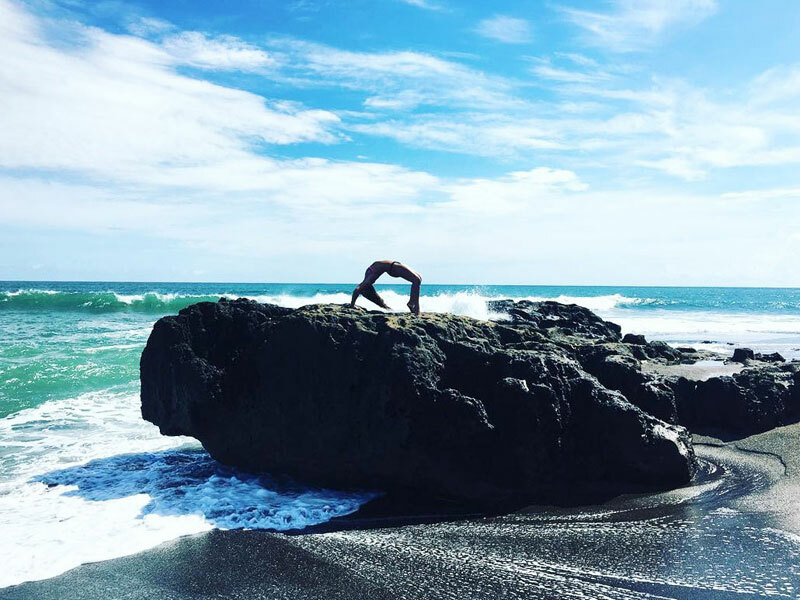 Work towards a healthier, happier you as you sign up for one of their monthly yoga and detox retreats. The programme includes two to three yoga classes per day, enough to lead you to your own personal nirvana. You’ll also have plenty of time to enjoy the slow rhythm of life at their onsite spa facilities that feature a sauna, steam rooms, warm and cold pools, as well as a meditation cave. 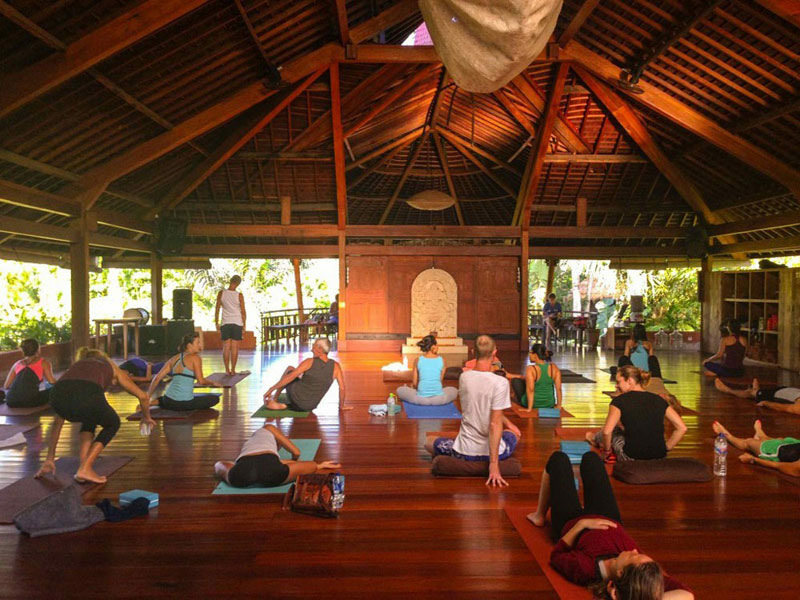 Boasting a natural wood and stone concept, and combining Balinese and Javanese design, this healing resort makes sure you’re ready for a vinyasa flow like no other you’ve seen before. 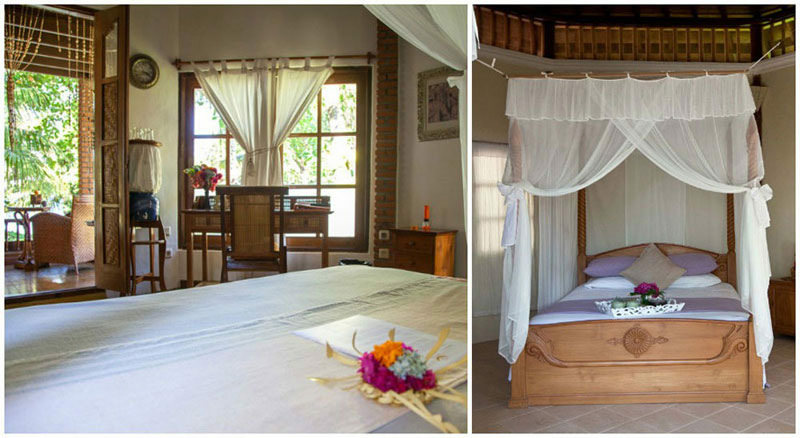 The comfortable villas prepare you for your purifying yoga cleanse, acting as the perfect respite to come back to further restore the harmony of your body, mind, and soul. Ready? Time to pack those yoga pants! Feel the stress ooze right out of your body with a yoga practice in the open-air shala at Azadi Retreat. 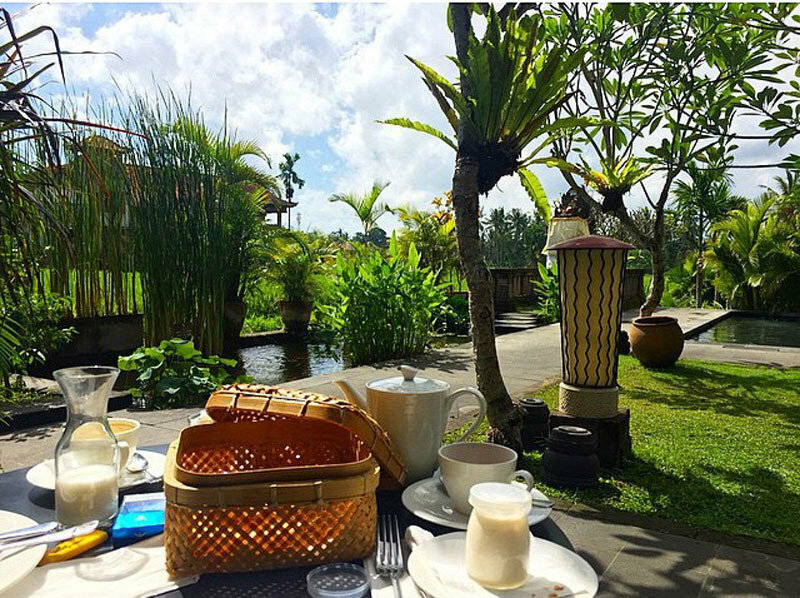 Besides the yoga program, the location is the real star here as you’re set with spectacular views of the surrounding rice fields and Mount Agung in the distance. Come to twist and tweak every last inch of your body to the sounds of the jungle and river running below you. 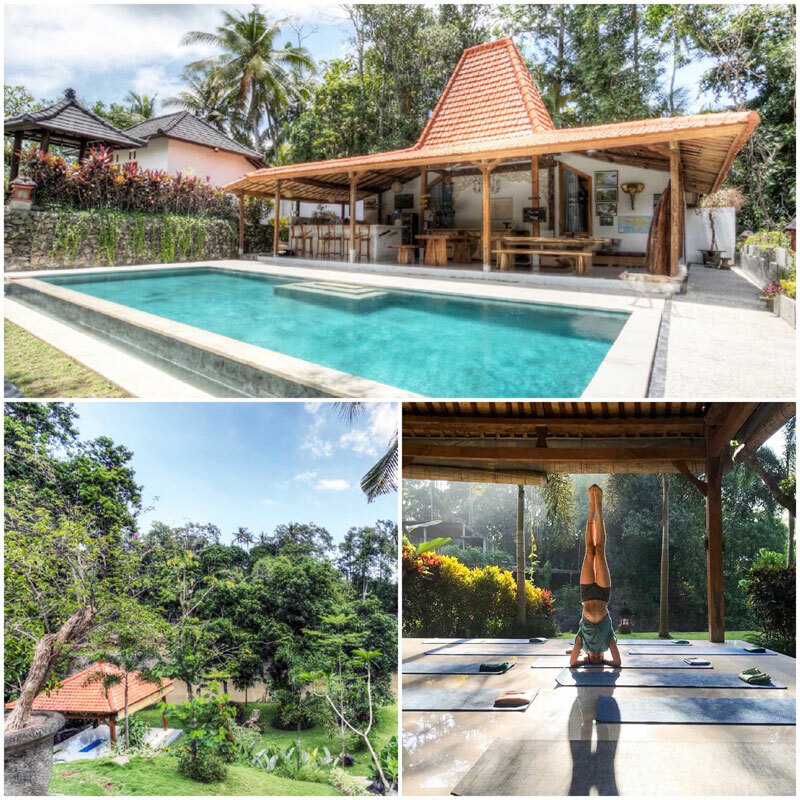 Located just outside the heart of Ubud, this peaceful retreat allows you to not only free your mind but also limber up your body. You’ll also be treated to body-renewing vegetarian meals for breakfast, lunch, and dinner throughout your all-inclusive stay, as well as soothing massages at their onsite spa. At their elegant villas, you get to truly cut yourself off from the rest of the world and turn your focus inward. 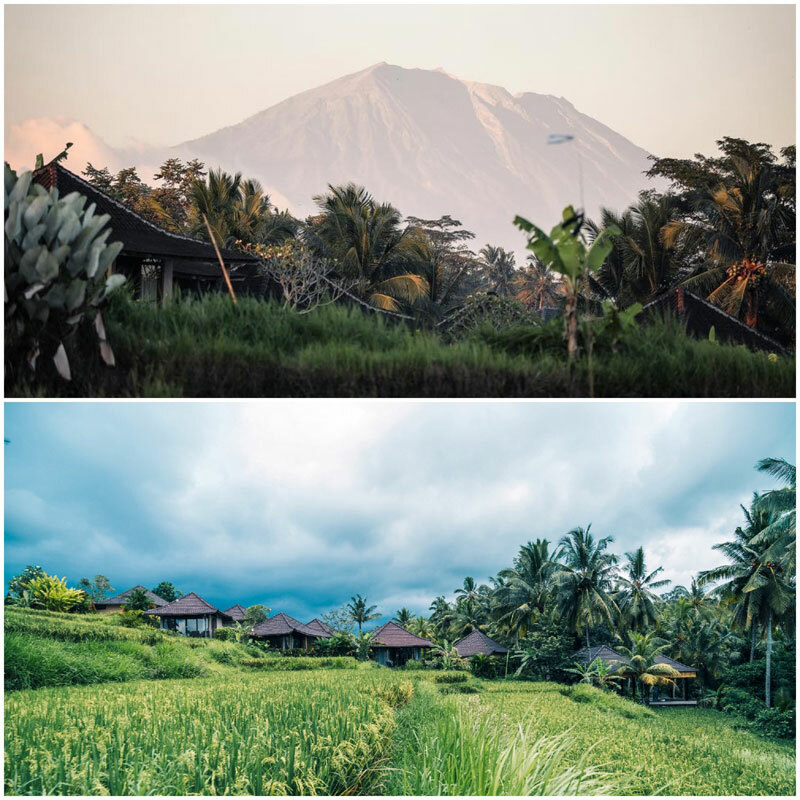 Views are never the same at Azadi Retreat as you get to relish the sunrise through the mist over neighbouring rice fields or enjoy a sunset over Mount Agung. 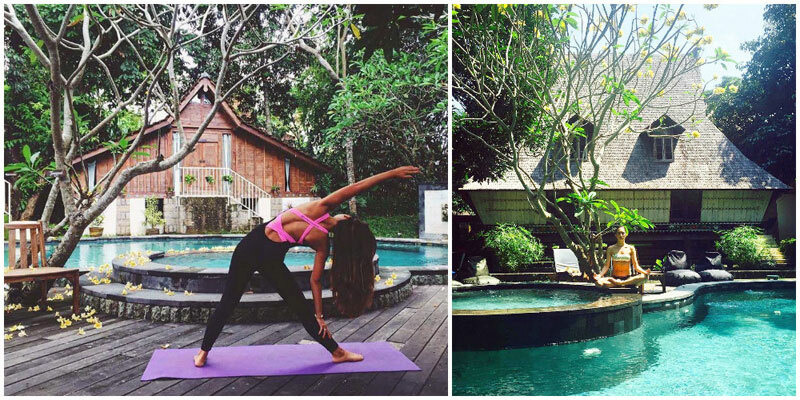 Where best to master your downward dog than set amidst lush green on a river bank in the heart of Bali? 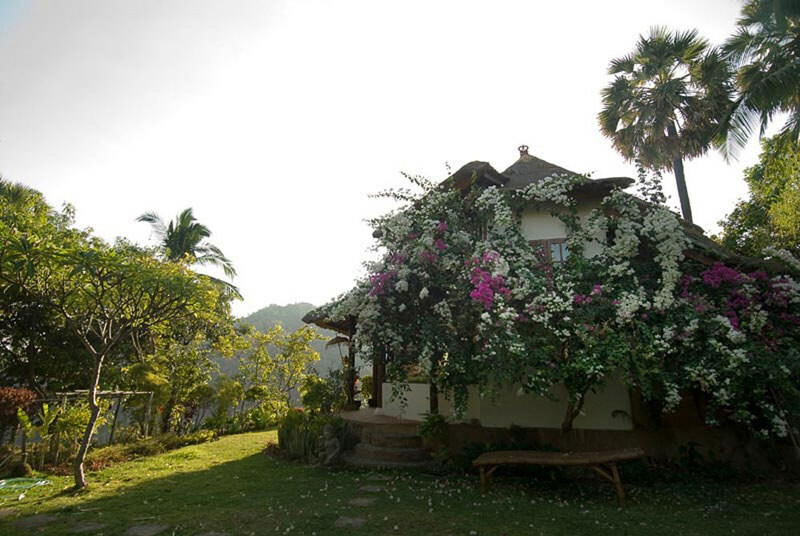 At Shanti Toya Ashram, you’ll find yourself soaking up the natural beauty of the surroundings while practising yoga. 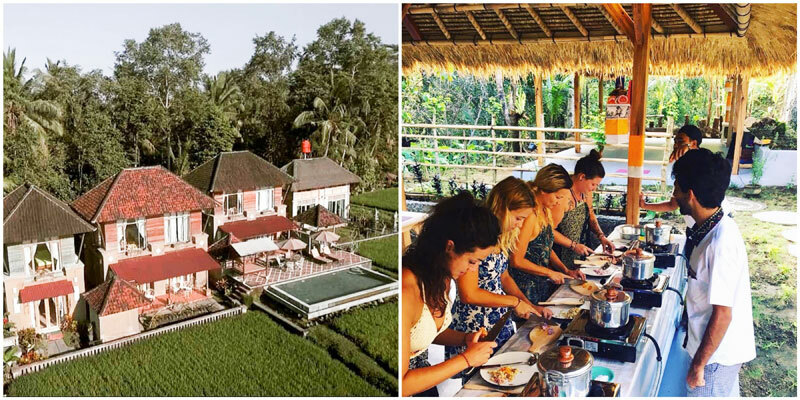 Their one-week yoga retreat will run you through a combination of yoga, wellness and cultural experiences, along with plenty of relaxing time to practise on your own and explore the nearby villages. 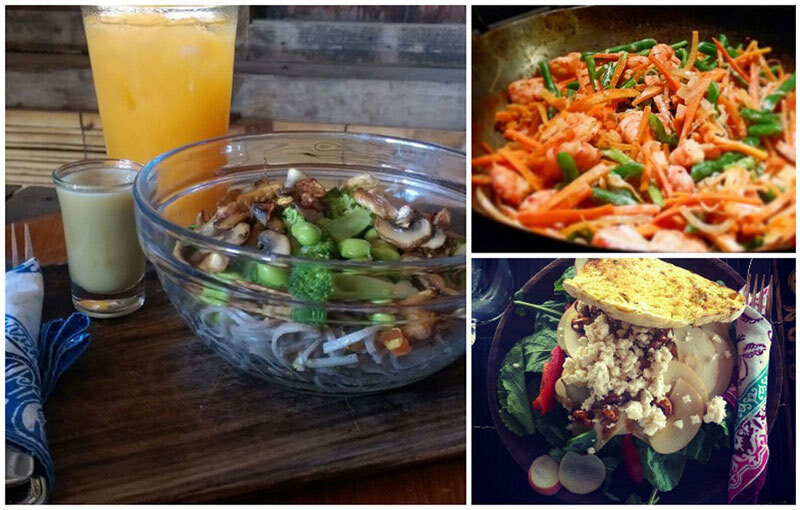 Back at base camp, you will be able to refuel with hearty vegan meals that only do good to your body! Meals can be tailored to accommodate your specific dietary requirements too. By now, you sure know that yoga and tranquillity complement each other like ying and yang, and this is what you get when signing up at Shanti Toya Ashram. 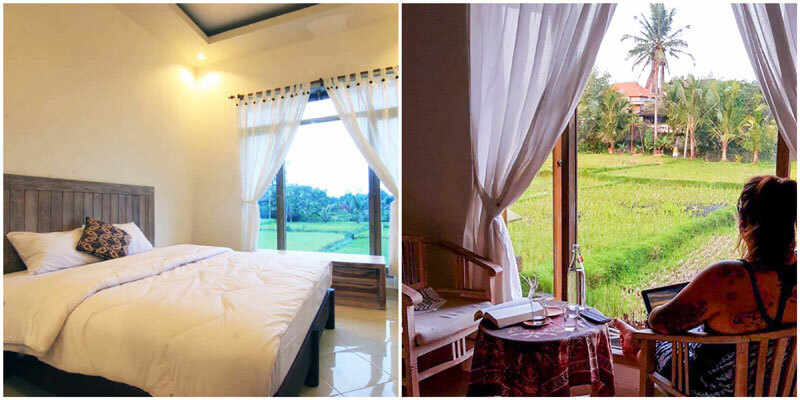 Their villas and suites offer an authentic taste of Bali, nestled in the quiet hillside of a lush jungle ravine and surrounded by the rice paddy farmlands of Penarungan village. And if you really count on coming home from vacation with a sunburn, they’ve got a spring water swimming pool for you to collect your tan lines or simple doze off with a good book! If you’ve been bitten by both the yoga bug and the travel bug, you’ll love rolling your yoga mat at FireFly Resort. 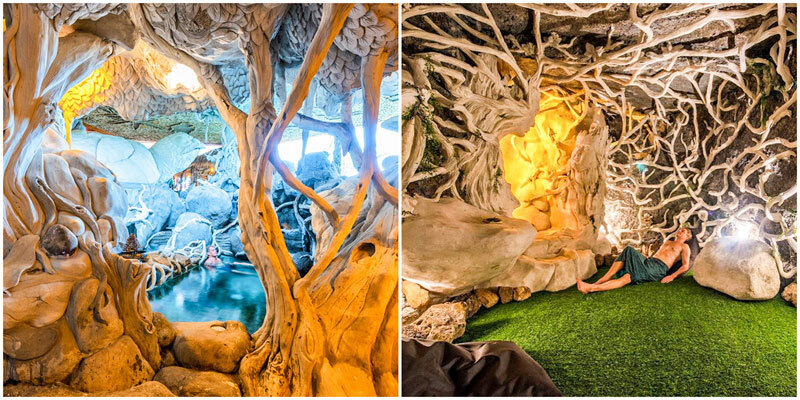 This scenic retreat takes your daily flow very seriously! 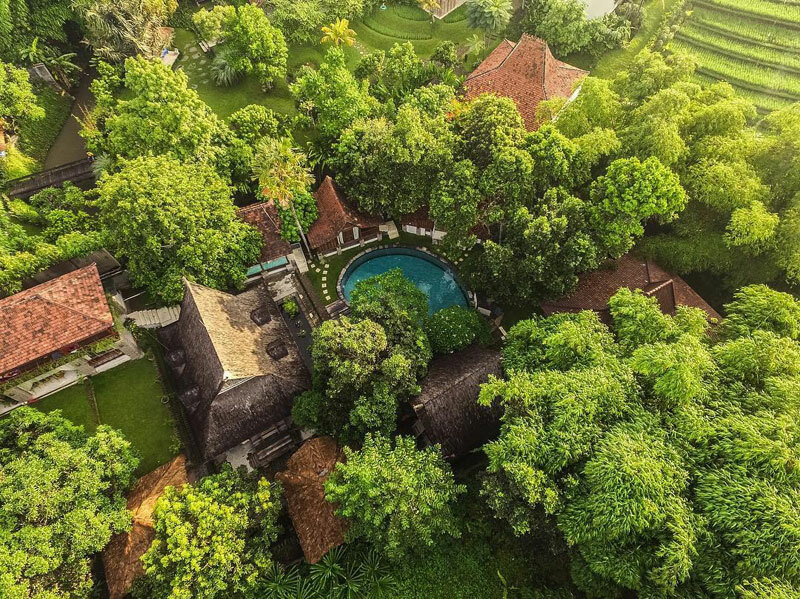 The lush greenery surrounding the retreat centre and the infinity pool overlooking perfectly aligned paddy fields definitely add to the atmosphere, so you can just let your cares float away. Booking a room at the resort allows you to have access to their daily programme that focuses on traditional practices to provide peace and balance for your body and mind. This truly relaxing experience takes turns between yoga practices, cultural experiences, meditation, dancing, chanting and excursions around the local neighbourhood. Their experiences are bound to stay with you even after the retreat. While you could do a yoga retreat in your backyard and it would be tremendously beneficial, practising in a whole new open-air environment could double up your chances to reconnect with yourself. An escape from everyday life is what FireFly Resort offers. Here, you’re in for a very personalised treat as the sanctuary only has 10 rooms on offer, which makes it perfect for a complete detox from the real world! It is not hard to see why Prana Veda Bali made it to this list. You’ll be immersed in nature from the moment you arrive at your yoga shala which invites you to practise yoga, meditation and dance with a spectacular view across the ocean. Trust us, you’ll instantly notice that the peace and pressure-free accepting attitude at this retreat is second to none! Take the opportunity to connect with yourself and with the stunning area around you. 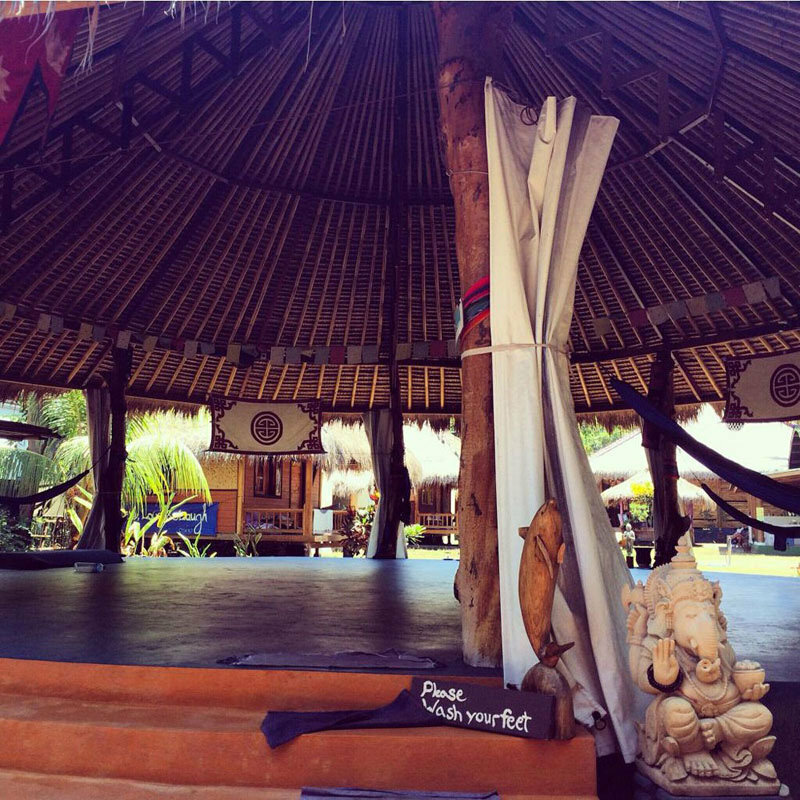 There is also a yoga shala located in the garden area for when you need something else than ocean views. 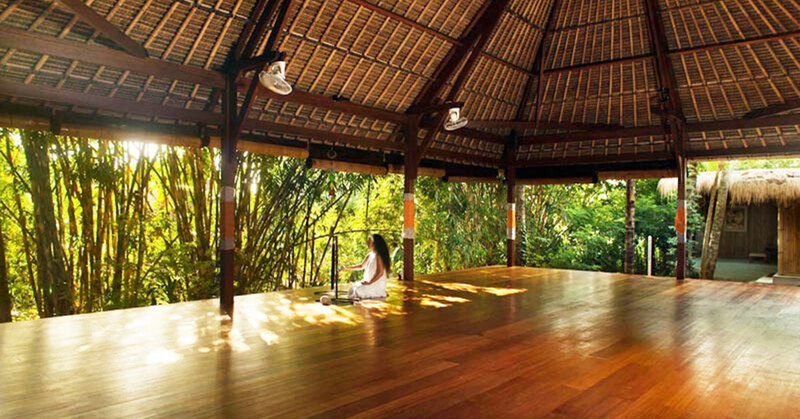 The sanctuary has extensive yoga and meditation programmes to satisfy any wellness wanderluster. What’s more, each practice is carefully curated to your level and is kept to a small group of 4-12 individuals. Their retreats are usually spread over weeks rather than days and are all about bringing you back to your day-to-day life, but with more passion and connection. 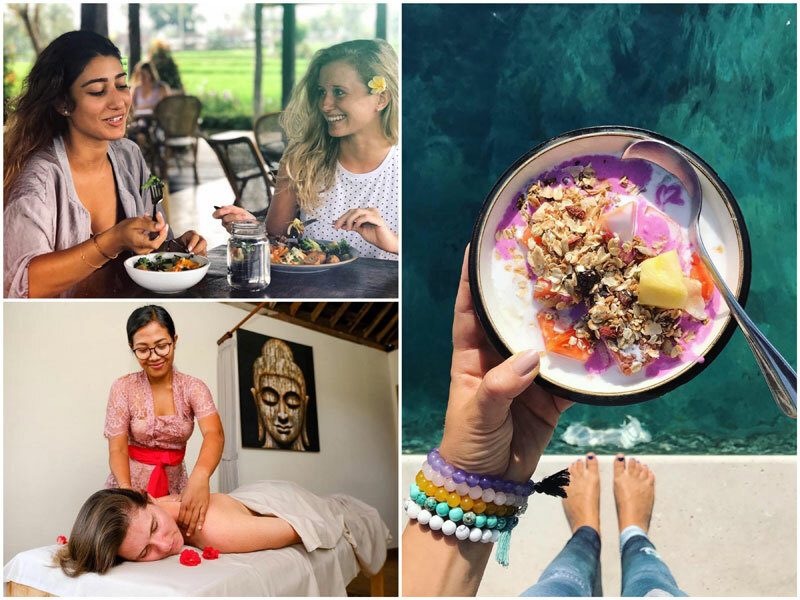 Regardless of whether through yoga, meditation, aqua healing, or Ayurveda, you’ll be able to find what fulfils you the most, all while under Bali’s vast blue sky. Interested in planned retreats? 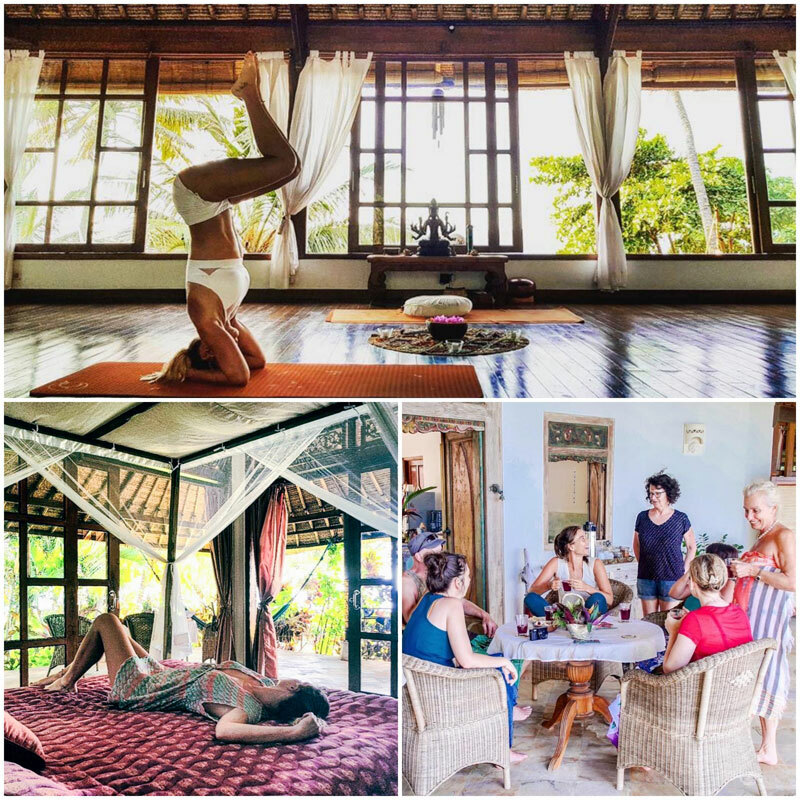 Whether you’re looking to learn how to teach Kundalini Yoga, or go deeper (and more creative) with a fascinating soul portraits retreat – Naya Ubud has a calendar of retreats all planned out for you. Structured to enhance community living, Naya Ubud is built around the Pool Joglo, a welcoming community lounge where people may sit and relax with food and juices. 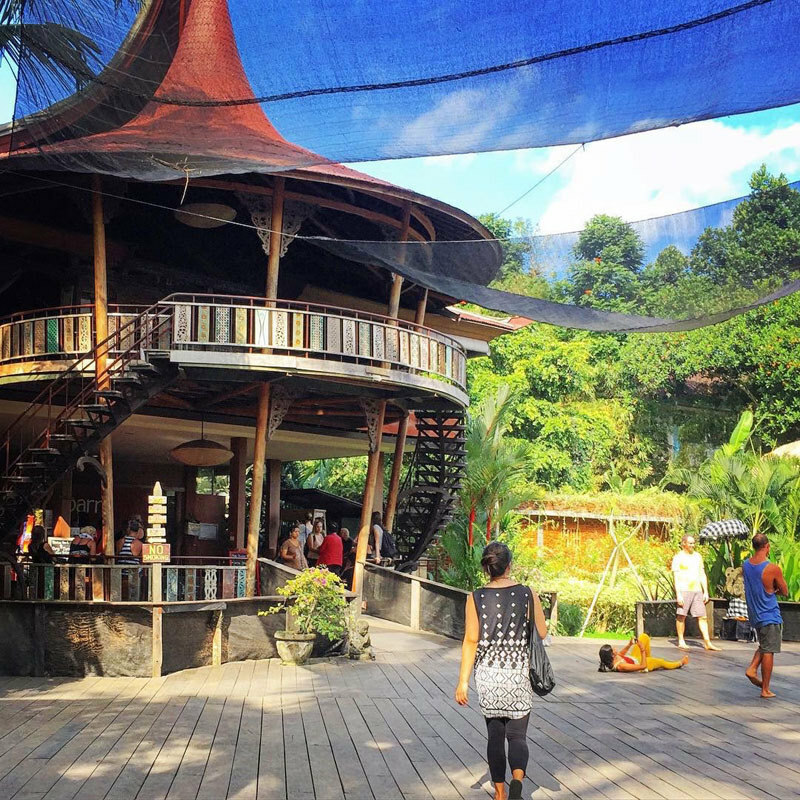 Even more impressive, the yoga shala where yoga classes, live music performance, meditation and dancing take place, is a beautiful Balinese pavilion which overlooks a pretty incredible view. And that’s not all. There’s also the amazing pool where you may cool off, and one interesting thing to note, is that the pool uses an Ozone cleansing system. This means smoother, and healthier water with 90% less chlorine – bringing you as close to nature while remaining as hygienic as possible. 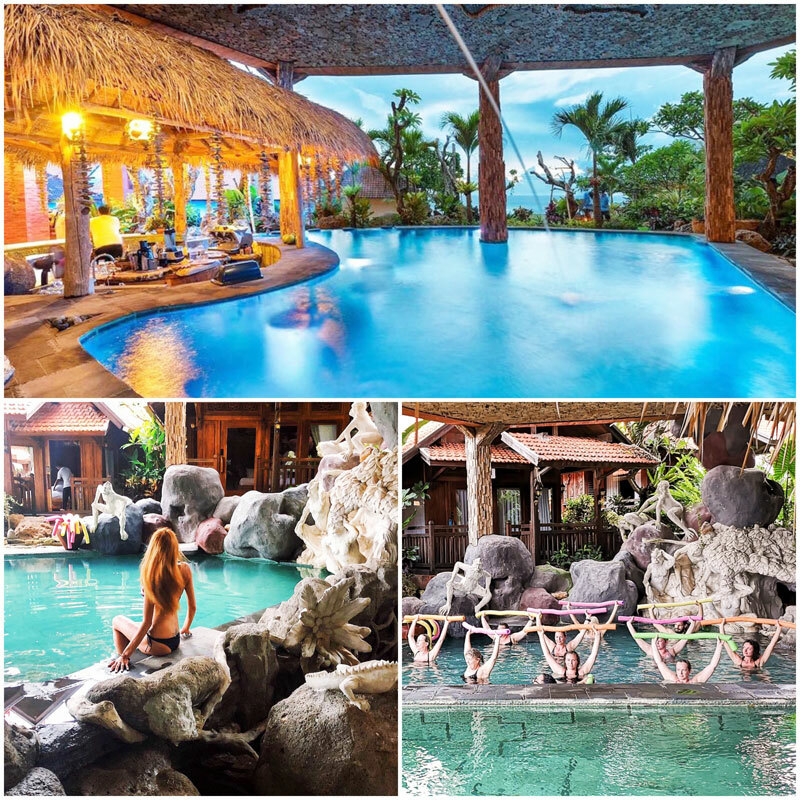 Naya Ubud takes the cake with everything available including the Naya Spa, a hair studio (everything from scalp massage to organic hair wash and even a stylish trim), and one of our favourites – the Steam Grotto. Imagine bathing in a steam room surrounding by volcanic rocks, where the waters are infused with essential oils to enhance relaxation. Doesn’t it sound just like a dream? 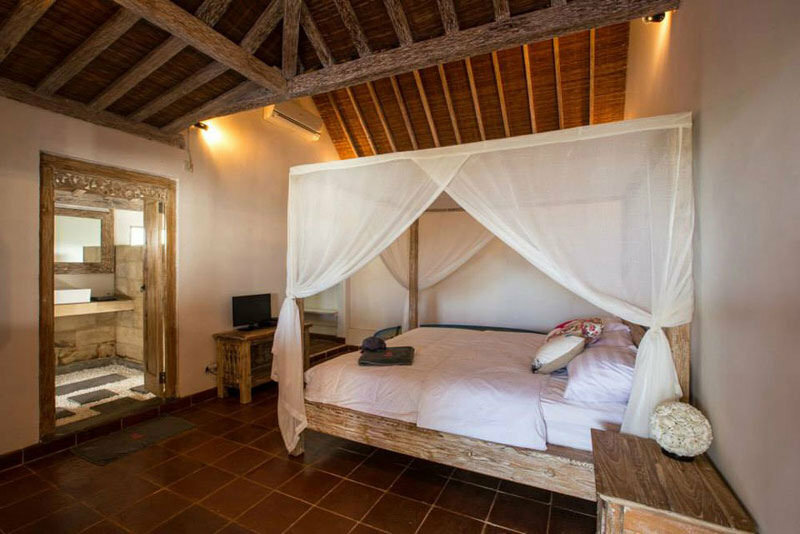 Do you yearn for the feeling of complete privacy, yet want to be close to the heart of Canggu? 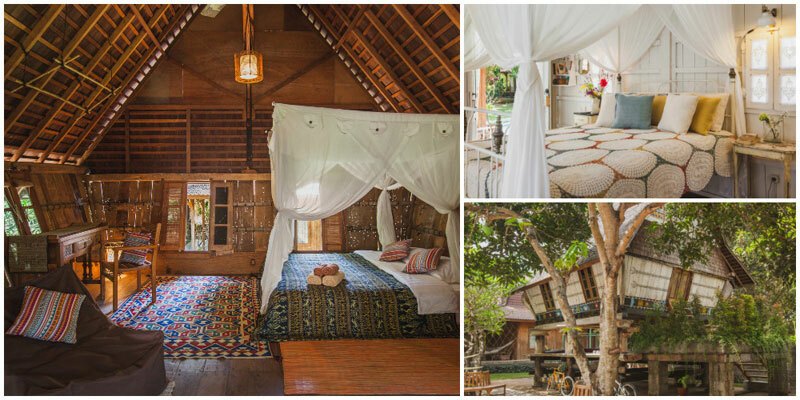 You’ll love Jungle Room, a unique complex of traditional wooden houses, each from different Indonesian islands, surrounded by nothing but lush greenery. 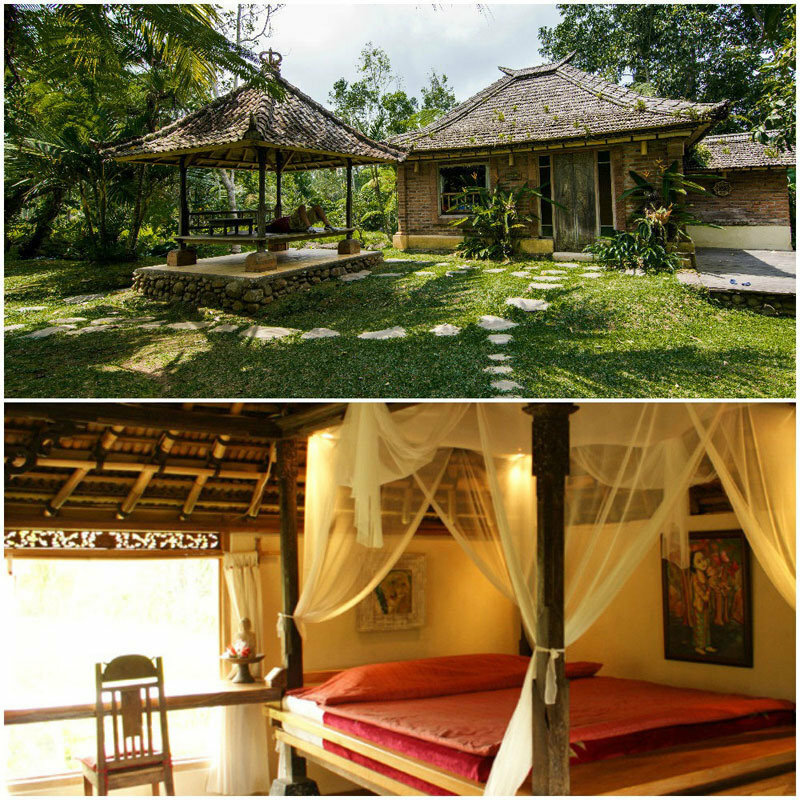 Would you prefer the hippie Sumatran Karo House or the cozy River View Bungalow? All guests are welcome to attend the complimentary daily yoga classes at 9am. 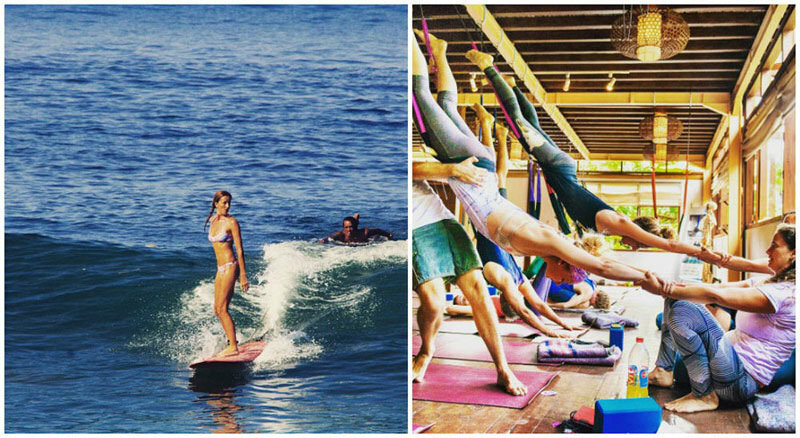 You can find yoga for surfers, ashtanga, vinyasa flow and more – there is something for every level and style. The yoga shala is a very small studio on the second floor, overlooking a beautiful crown of trees. 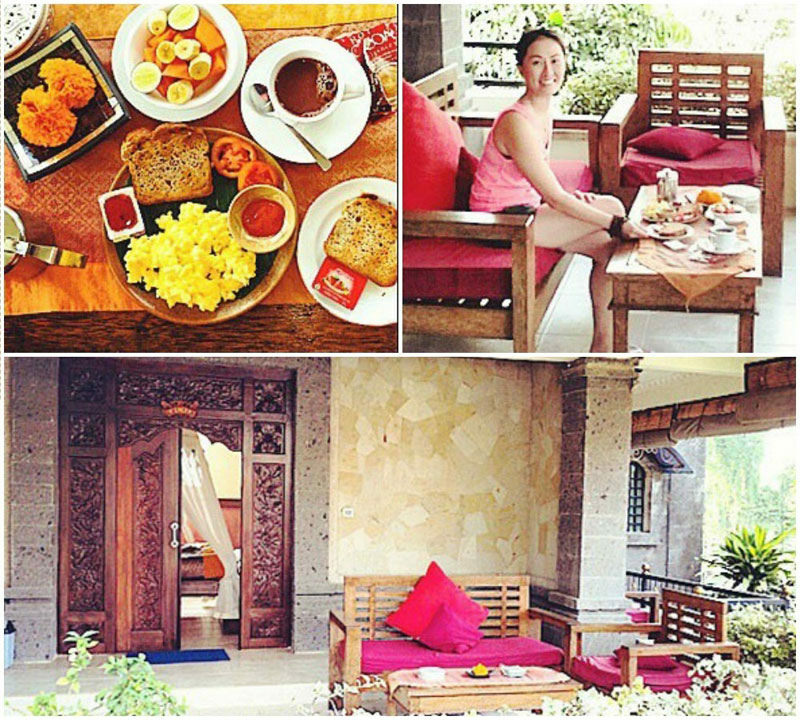 Start your day with a nice yoga stretch and have a healthy breakfast by the pool after. 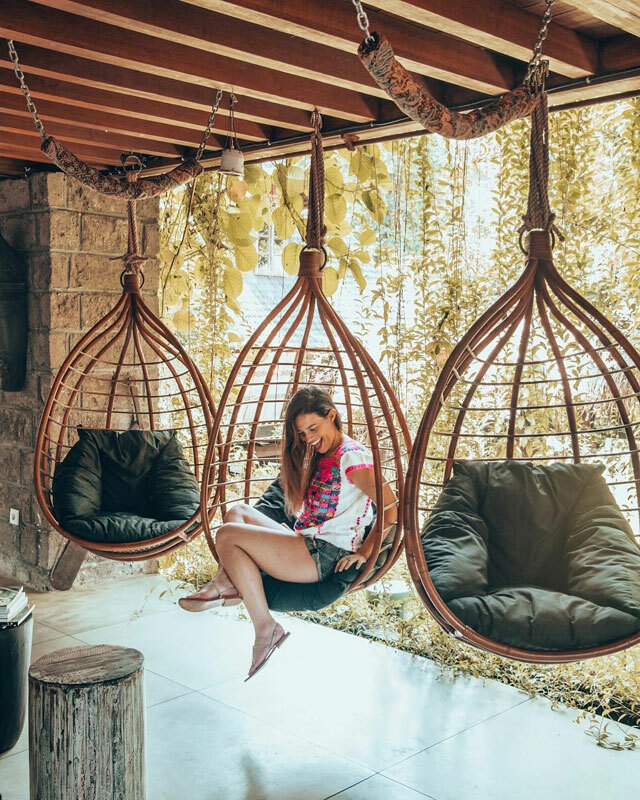 There’s also a juice bar, serving fresh and organic juices and smoothies, and you can chill in those cool swing chairs! “Kura Kura” is an Indonesian word for turtles, animals that are never stressed or in a rush. That’s the main reason why the owners chose to name their retreat after them – a place where you can slow down, relax and re-energise yourself. Former guests can never get enough of the delicious vegetarian food served during the retreats – a sign that you’ll love it too! You can also practice yoga in a studio with this cool window view, overlooking the tranquil pool. And what can be better than enjoying a nice cool dip in the pool after yoga practice? With the beach just minutes away from your doorstep, you can try to even practise yoga there as often as you wish! 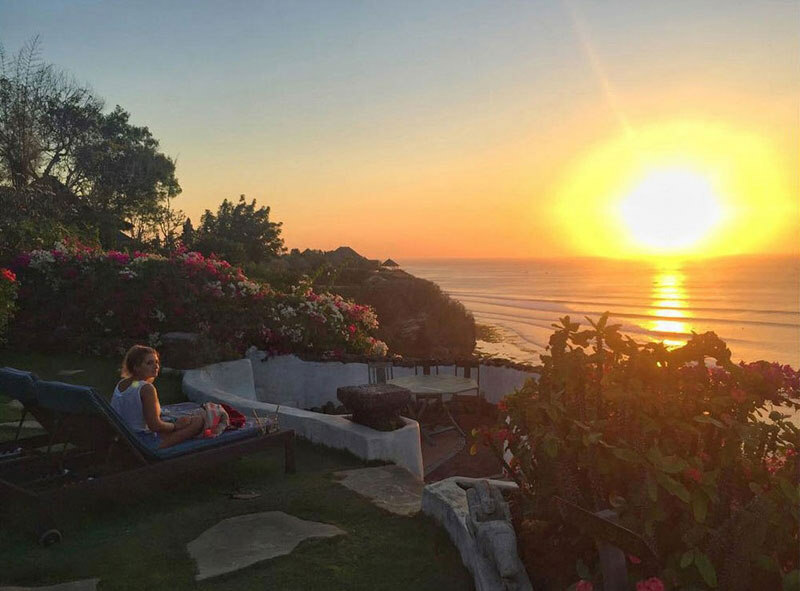 Kura Kura is also only a few minutes’ drive from the famous Balinese temple, Tanah Lot, where you can watch stunning sunsets. You can take part in lots of interesting retreats each month at Kura Kura. 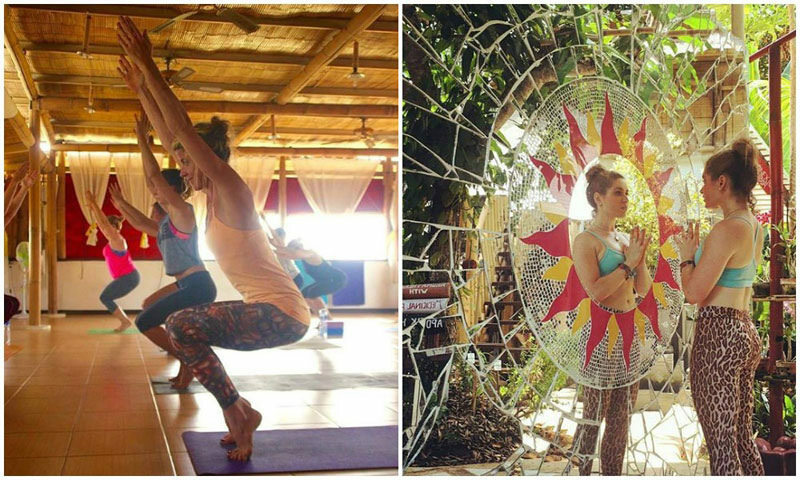 Simply check out their calendar for upcoming yoga retreats, choose a teacher you like and a programme that suits you! It’s been said before, but we’ll say it again – Ubud really is the cultural and spiritual capital of Bali. The cliche exists for a reason – there really is something special about Ubud. This has made the village a real hotspot of retreats and spas offering a whole smorgasbord of yoga classes and healing treatments. In this sea of choices, the Blooming Lotus Yoga Studio is a real gem. Blooming Lotus is a great option for visitors who don’t simply wish to be pampered on their vacation but are genuinely interested in practicing yoga. 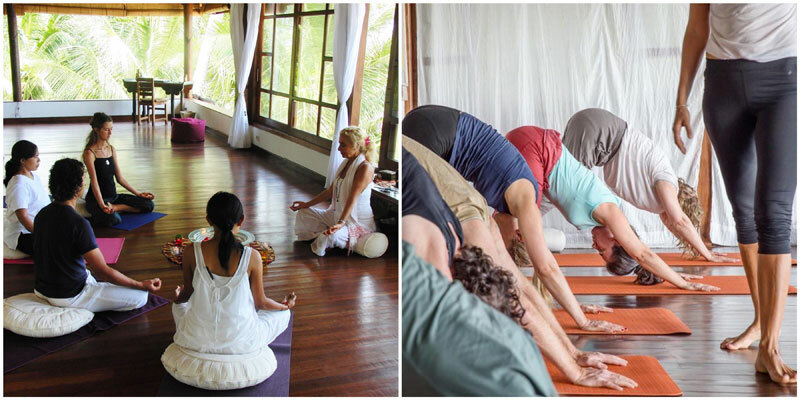 A 4-day 3-night retreat at Blooming Lotus includes two vinyasa yoga classes daily, a workshop providing insight into yogic lifestyle as well as daily meditation classes. The retreat is best suited for beginners and intermediate level students. Guests are also invited to attend a Balinese cultural event during their stay. Healthy vegetarian breakfast and lunch are also included in the retreat package. 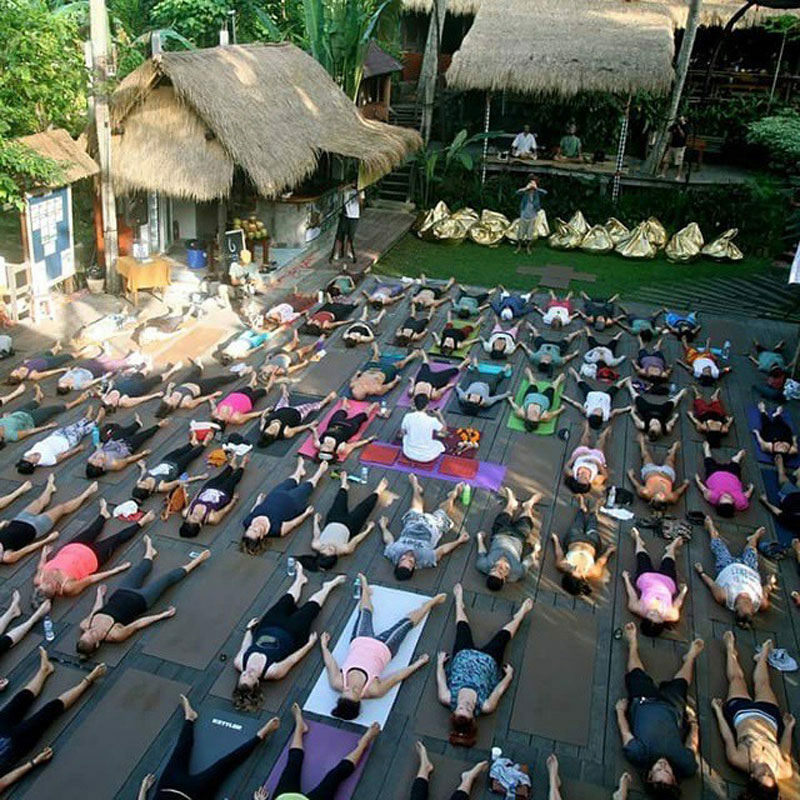 The fact that Ubud has become such a mecca for yoga and spirituality has hiked the prices up, too. 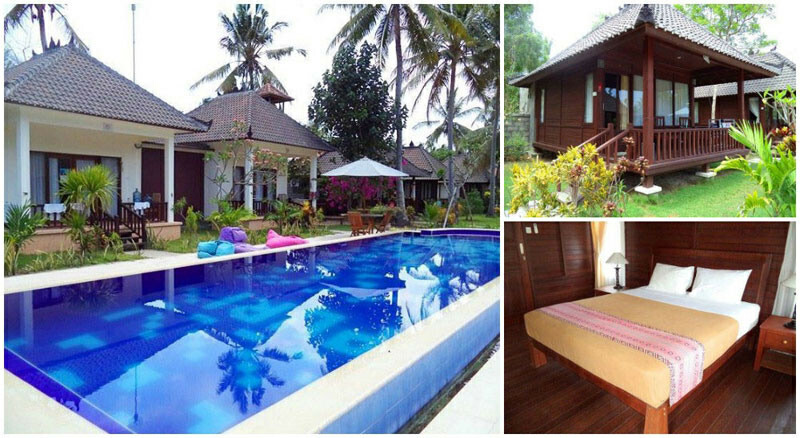 Om Ham Retreat & Resort is a refreshingly affordable option as it really does offer guests luxury retreats on a budget. The location is simply stunning. 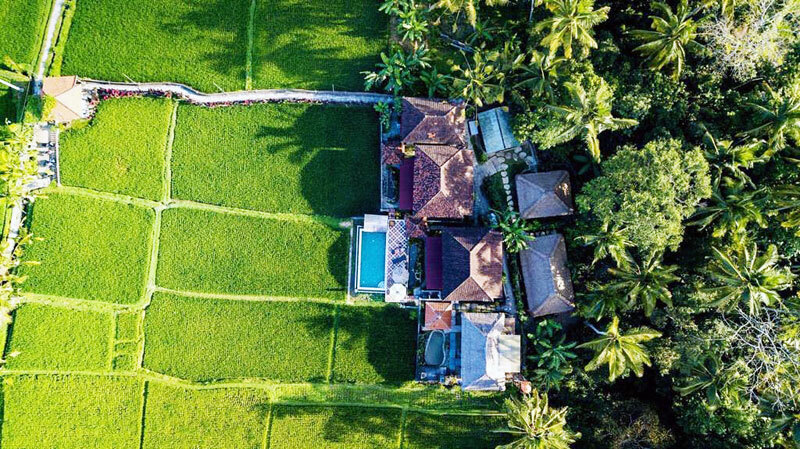 The surrounding area is covered with green rice paddies – while inside the retreat guests can relax in the beautiful private garden, or take a dip in the spacious pool. 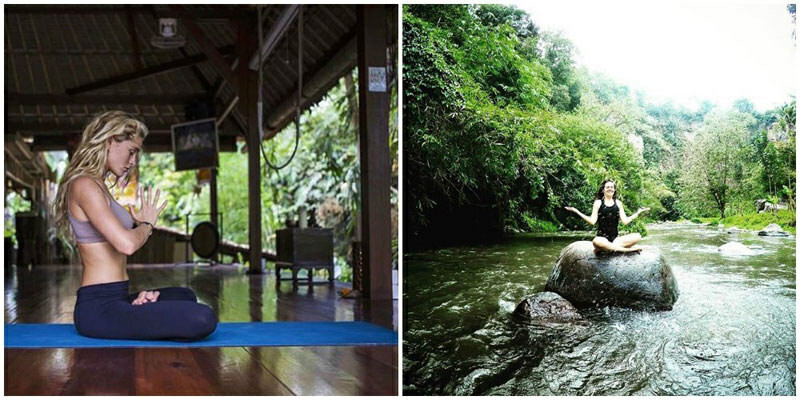 Retreats at Om Ham include yoga, spa treatments and guided meditation classes. Another cool thing Om Ham offers? Romantic retreats for couples where you can enjoy pampering spa treatments, take in the beautiful scenery and dine in style in Ubud with that special someone. A 13-night retreat at Om Ham includes three classes of Kundalini Tantra yoga as well two sessions of guided deep meditation. Guests are treated to a daily healthy breakfast, a one time two-course organic lunch as well as a three-course organic dinner. 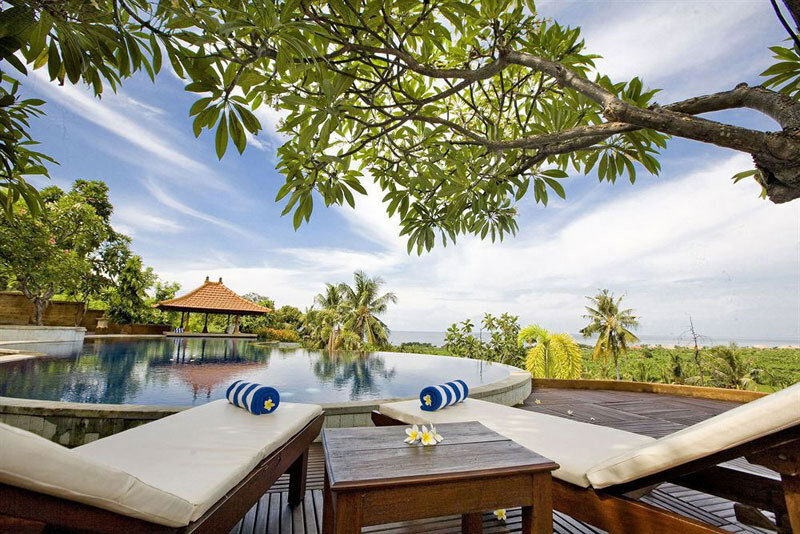 As a nice added bonus, this retreat at Om Ham also includes a rejuvenating spa treatment session. Nothing feels sweeter than having family around, even when you’re miles away from home – and at Serenity Eco Guest House, family is what you can expect to find. Built in 2003 by Frenchman Daniel (who’s also yoga teacher!) 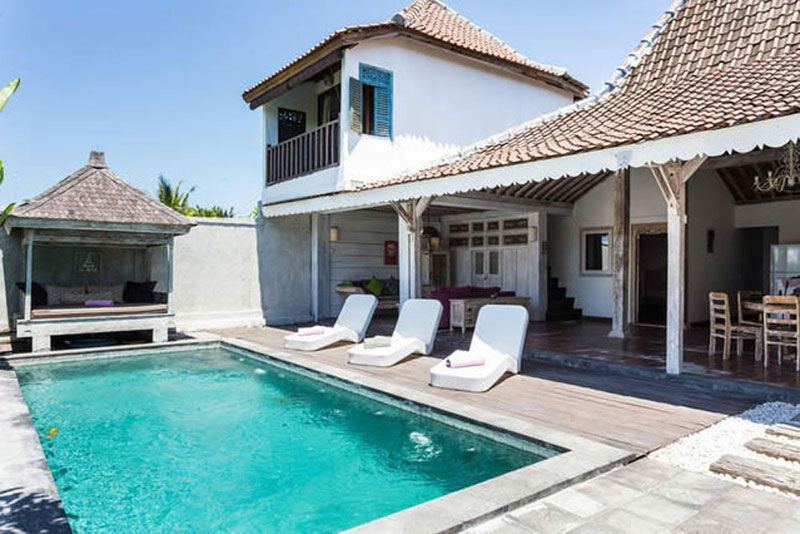 and his Balinese wife Yatna, Serenity was originally a family home for their little family of 4, with 2 additional villas for visiting friends and family. Moving forward to today, family-owned Serenity has evolved into a hidden gem of a space for travellers, most especially those with a keen interest in yoga. 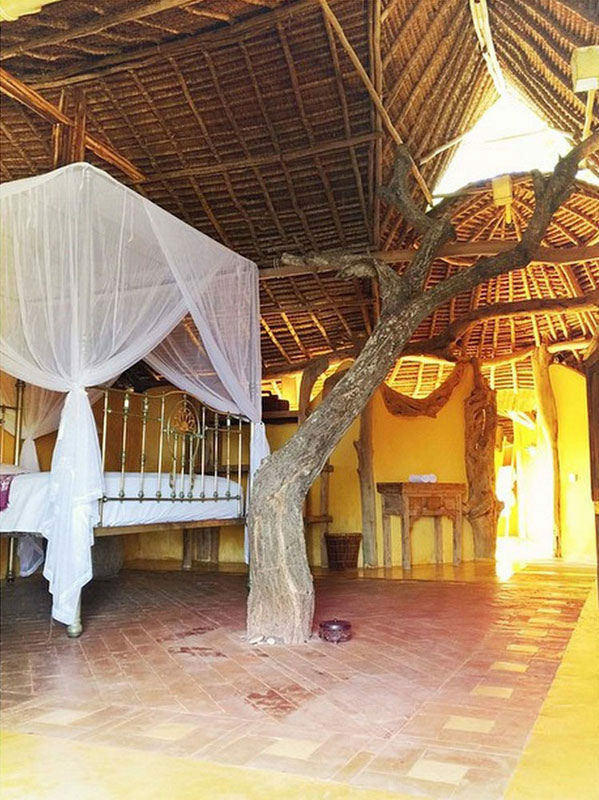 There are 2 yoga halls with daily yoga classes at the Yoga Shala, and a massage room with different treatments available. 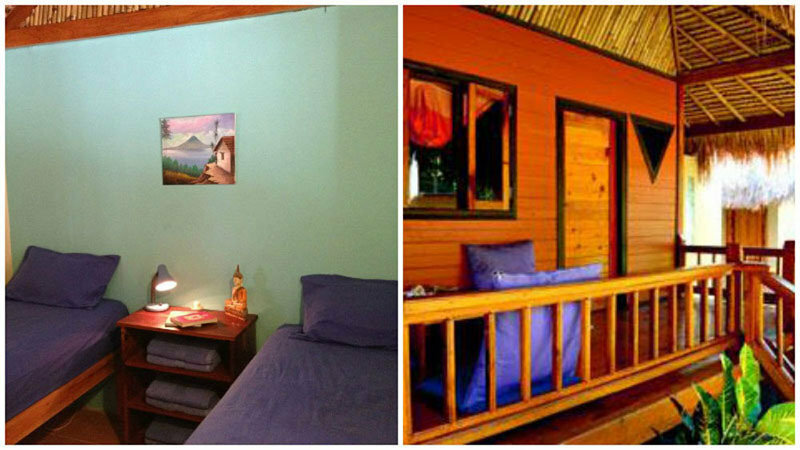 There are many other interesting spots around Serenity that you may settle into and relax – or even get some meditation done at the meditation room (only for Vipassana meditation). 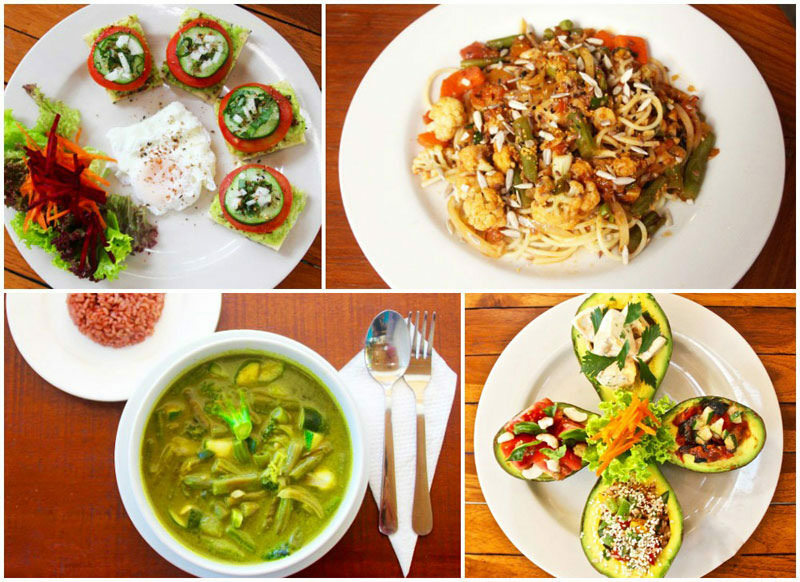 If you are craving healthy meals, their in-house eatery – Alkaline Restaurant serves healthy homemade meals with no MSG. 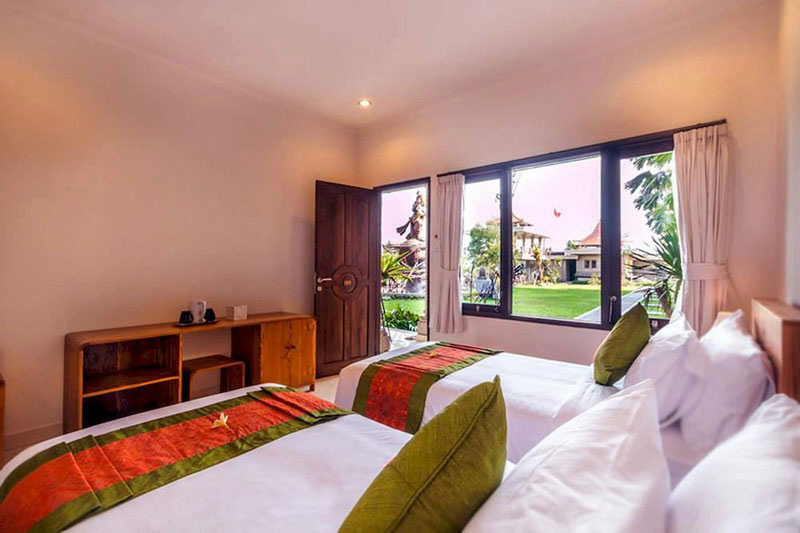 Lastly, the location of Serenity is perfect if you’d like to be right in the middle – close enough to the main areas of Seminyak, Kuta, and even Ubud! 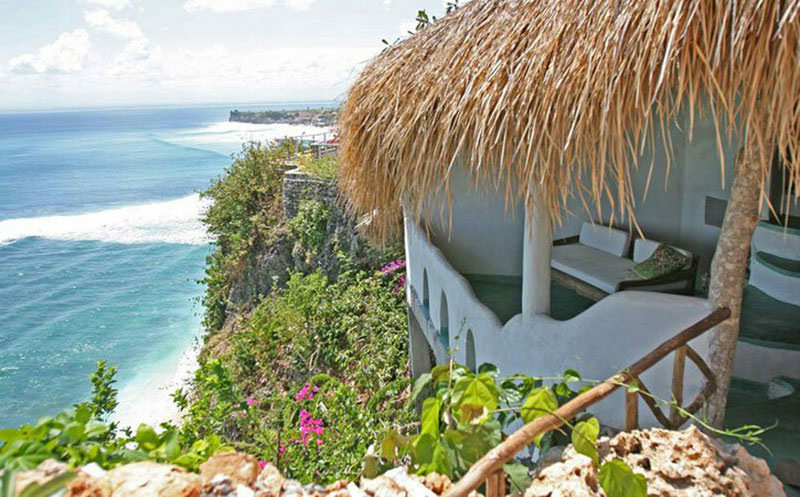 A short boat-ride from sleepy Sanur, you can experience the soothing magic of yoga on beautiful, laid-back Nusa Penida. With its tranquil open air yoga shala, the Serenity Yoga Studio offers visitors a beautiful beachside setting far away from the crowds. Drawing great inspiration from their seaside setting, Serenity is a perfect choice for all surfers and mermaids out there. Guests can try everything from paddle board yoga to snorkeling with manta rays. And after all that excitement, you get to rewind with a complimentary two-hour massage. A word of warning might be in order here – once you arrive here, you might never want to leave. A 5-night retreat at Serenity Yoga includes a lavish welcome meal, daily breakfasts and of course, unlimited yoga classes. The styles of yoga featured at Serenity range from vinyasa to hatha all the way to aerial and SUP Yoga. The classes are designed to suit practitioners of all levels. Better yet, snorkeling with manta rays and a two hour massage are also included in the retreat package! This one’s for the cool kids. 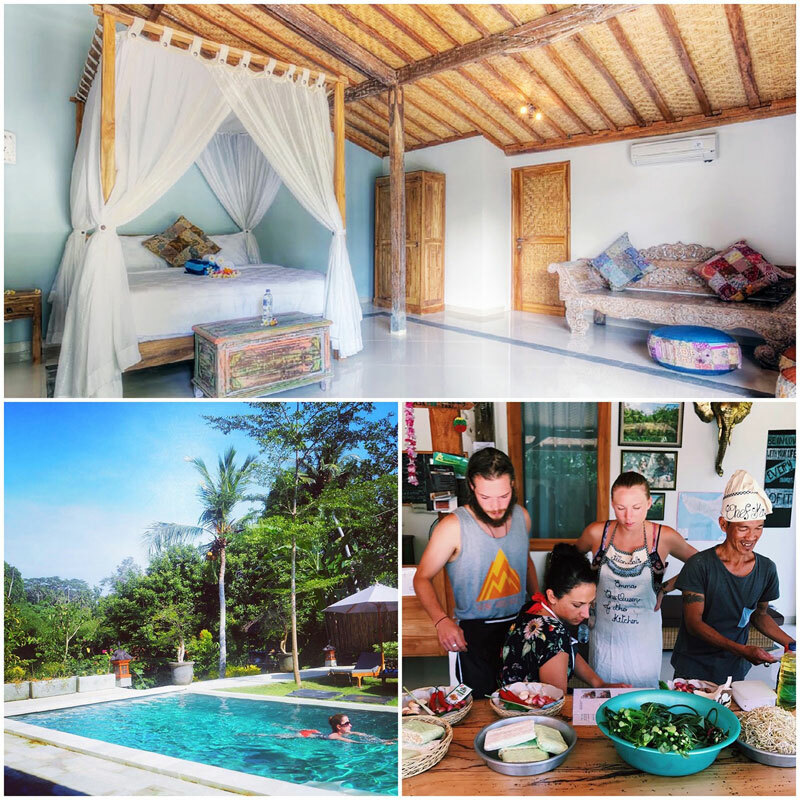 True to its location in the groovy surf district of Canggu, retreats at The Pineapple House feature both simply yoga, and surf and yoga packages (whichever you are so inclined). 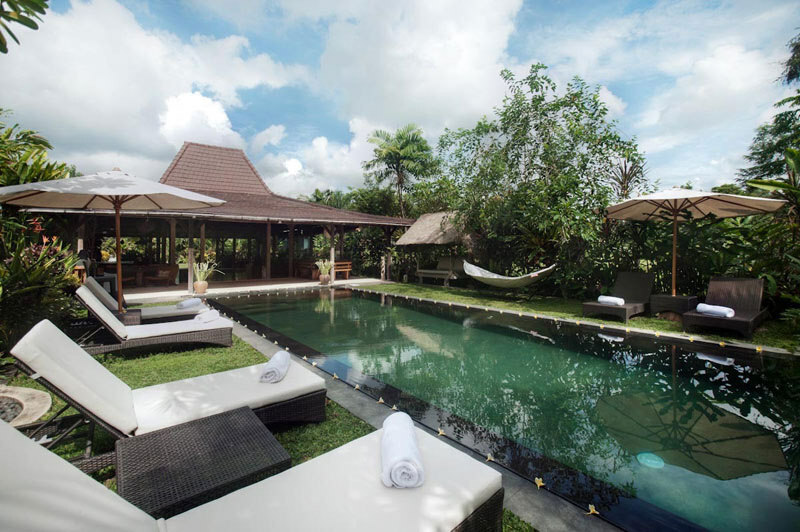 Canggu in turn offers a great setting for any vacation. 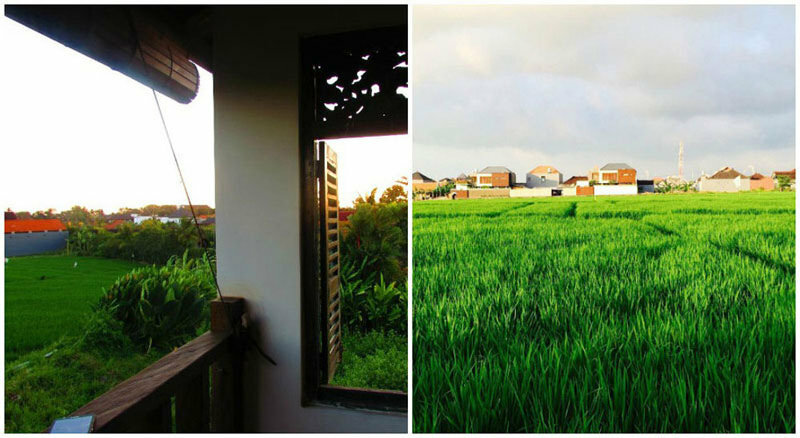 Rice paddies, world class surf breaks, parties that go on until dawn – you can find all of this and more right here in Canggu. As an added plus, The Pineapple House also offers an affordable “Free To Roam” package, ideal for the independent traveler. This package includes only the bare-bone essentials (as well as a single yoga class and a massage) and allows guests the freedom to come and go as they please at a great price. 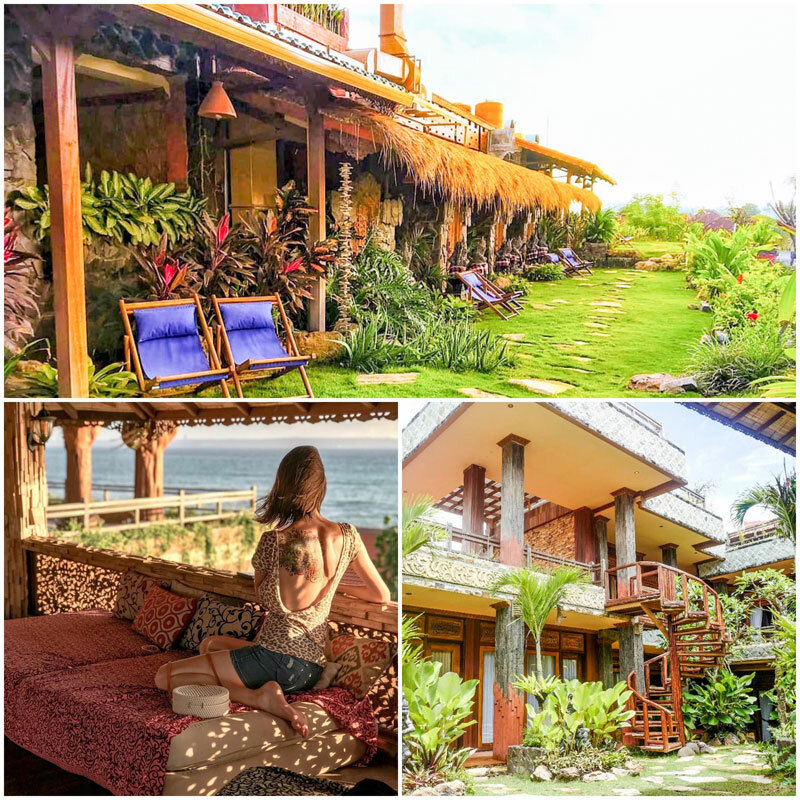 A 8-day 7-night retreat at The Pineapple House includes three guided yoga classes as well as five surf lessons tailored to suit each guest’s level of experience. Yoga classes feature styles from hatha to ashtanga and beyond. 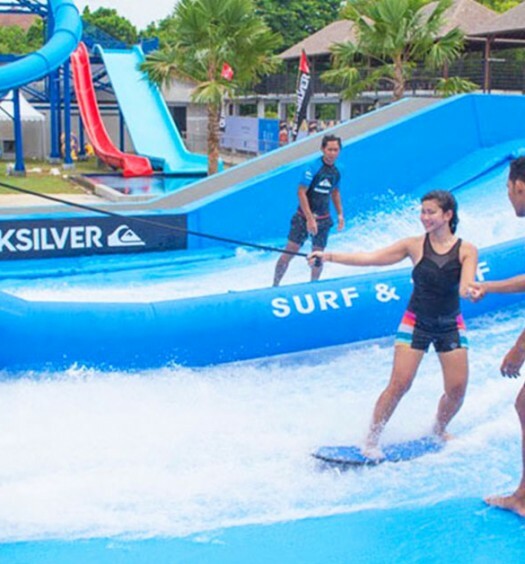 Both yoga and surfing lessons provided are suitable for all levels of experience. After a day of catching waves, one in-house massage is also included included in the retreat package to sooth sore muscles. The price also includes a daily breakfast and airport transport. 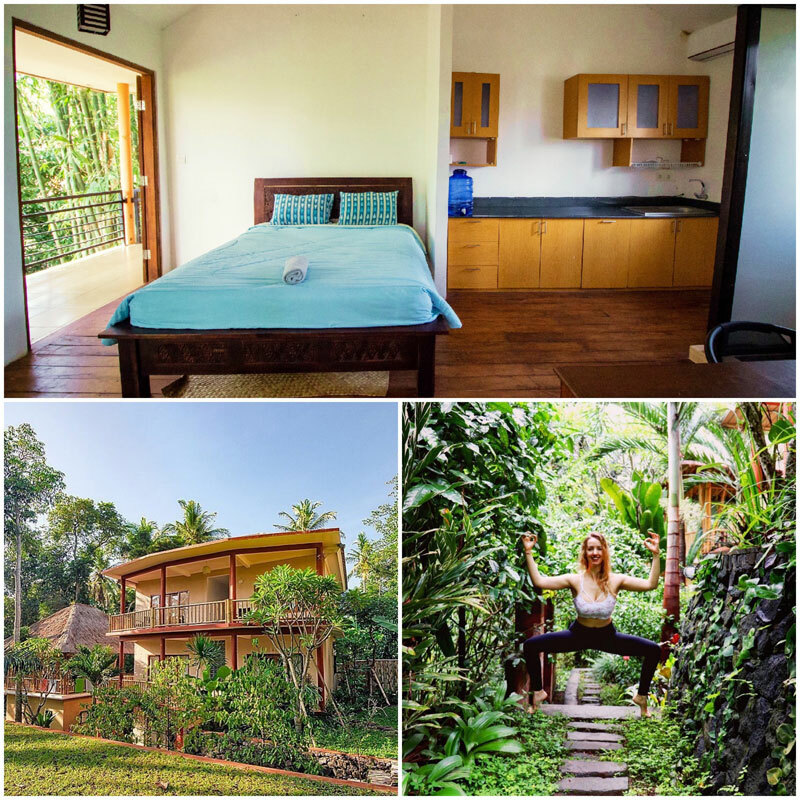 Looking for a truly affordable yoga retreat? 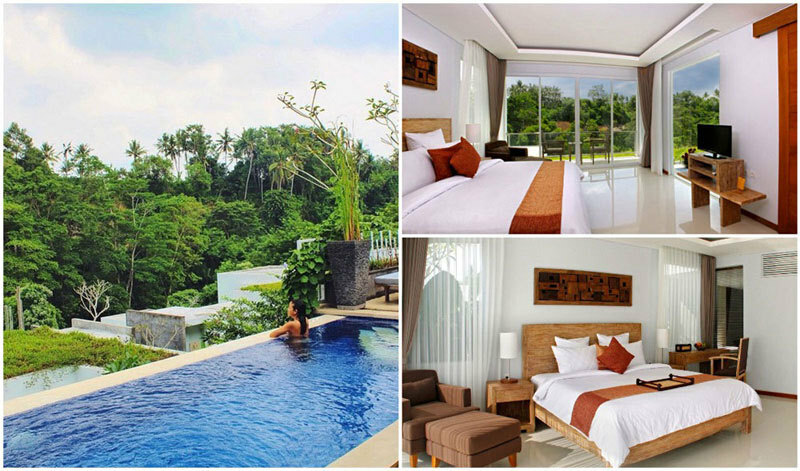 Look no further, Ubud Aura’s Deluxe rooms are the perfect mix of comfort and convenience for the ultimate relaxation. 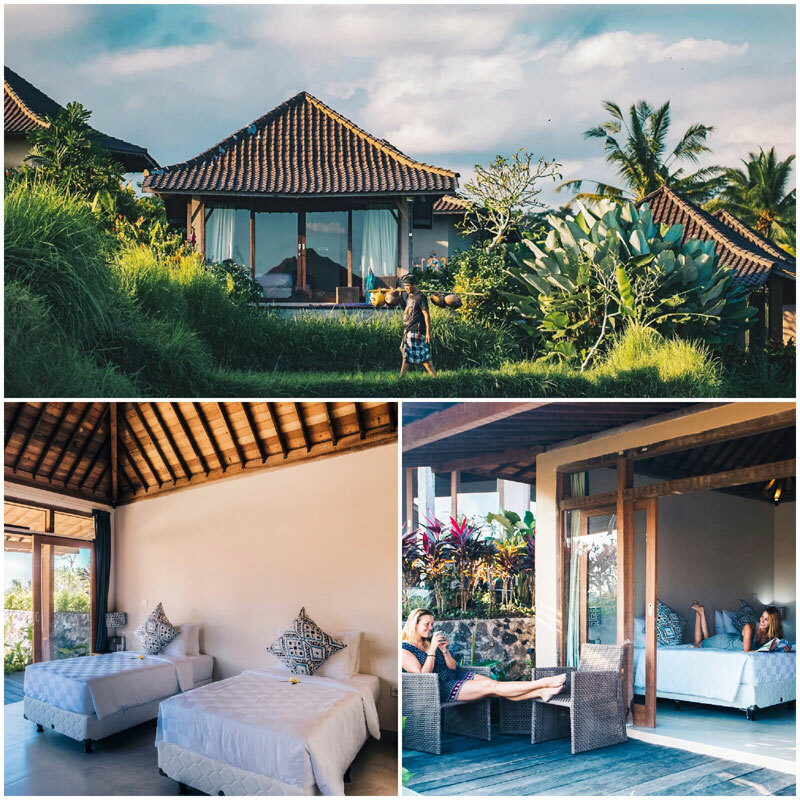 Complete with your private verandah to relax at after yoga sessions in Ubud Aura’s yoga studio, and en-suite bathrooms with a bathtub for soaking your stretched muscles – this is the yoga retreat of your dreams. First up, the yoga studio. Available for guests, the studio comes equipped. Pull out a mat and begin with the Tadasana (Mountain Pose) to get started. 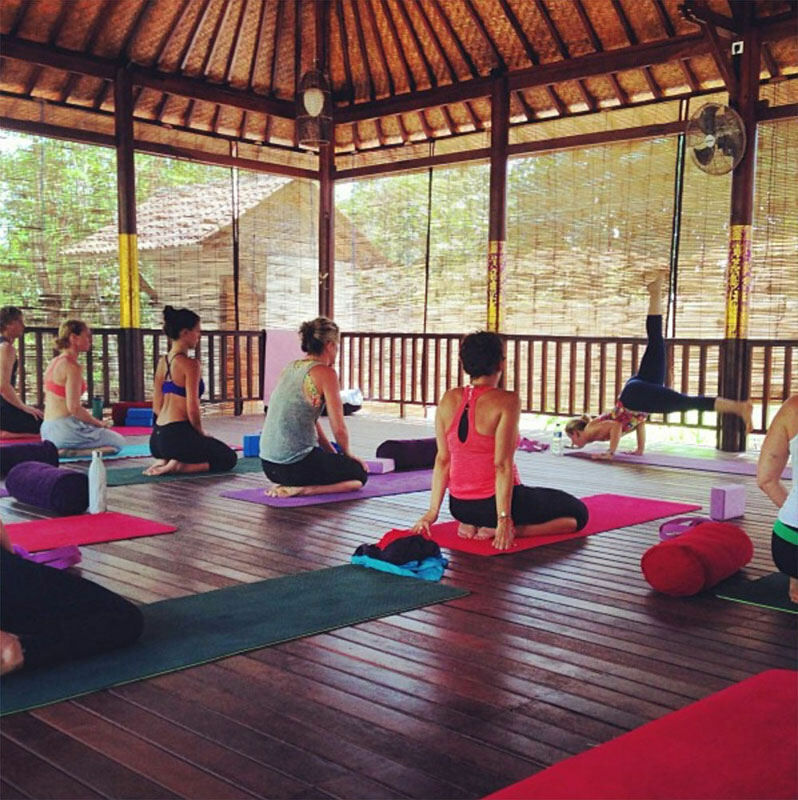 If you’re here as a group and require a yoga teacher, make a request and Ubud Aura will help to organise a yoga teacher to lead your group. 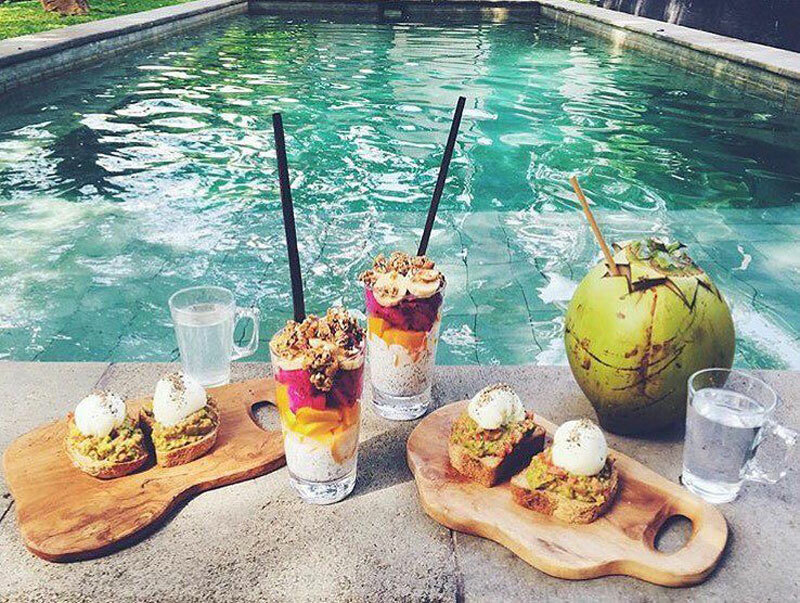 Once you’re done with yoga for the morning, there’s also a swimming pool for your daily swim, and if you’re a little hungry, feel free to order drinks for poolside nibbles. With a library on the second floor, feed your mind after feeding your body (food), and soul (yoga)! For breakfast, simply head to the poolside dining spot where you’ll be offered a complimentary herbal tonic to perk you up. Otherwise, room service is also available. 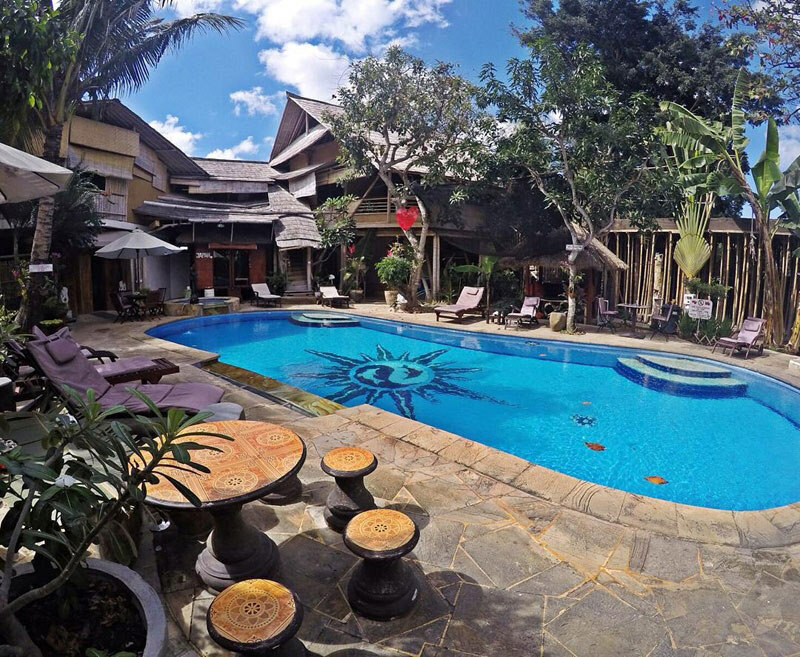 Ubud Aura Retreat is beautiful and intimate with attentive staff looking to meet your needs. And if you’re looking to get out, there are free shuttle services bringing you around the main areas of Ubud. PS: Customised tours of ancient temples are available here too, if you’re interested in undertaking a different type of spiritual journey – or are simply out to explore! PPS: Make sure to check out the spa if you’re there! We’ve heard rave reviews about the treatments available. So you’ve heard about the famous Yoga Barn and the classes they offer. 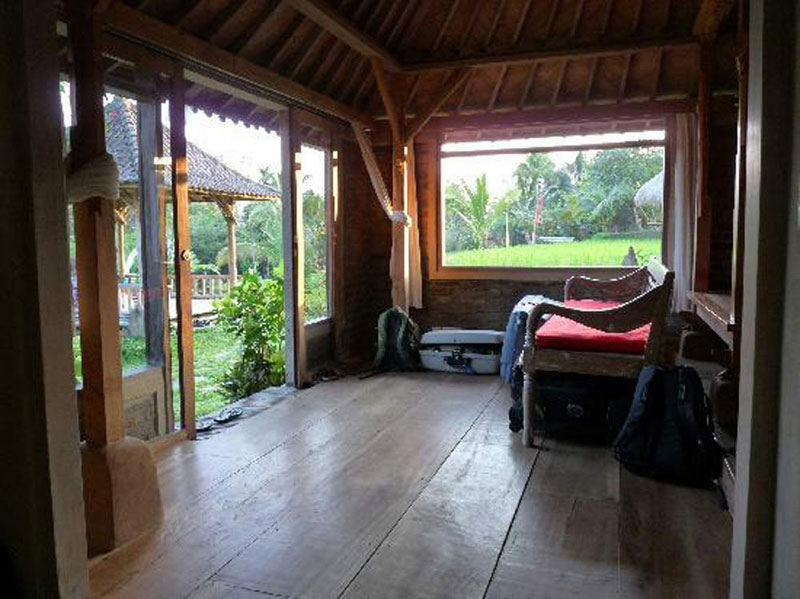 Did you also know that there’s a Yoga Barn Guesthouse for those looking for a dedicated yoga retreat holiday? Best of all, staying at Yoga Barn is easy on the wallet with room prices under $100. And if you’re a group of girlfriends looking to getaway and destress with a yoga retreat, you’ll be happy to know that Yoga Barn offers a shared dorm for ladies (at only $25!). The maximum occupancy for each dorm is up to 4 pax, so you know you and your friends will be nice and cosy having a great time together. If not, you can always make new friends with your fellow dorm-mates, or simply book any of the other private rooms. With their commitment to providing a safe and healing environment for yoga enthusiasts, Yoga Barn’s amenities include Kush Ayurvedic Spa that provides everything from healing treatments to massages, along with other classes and workshops. 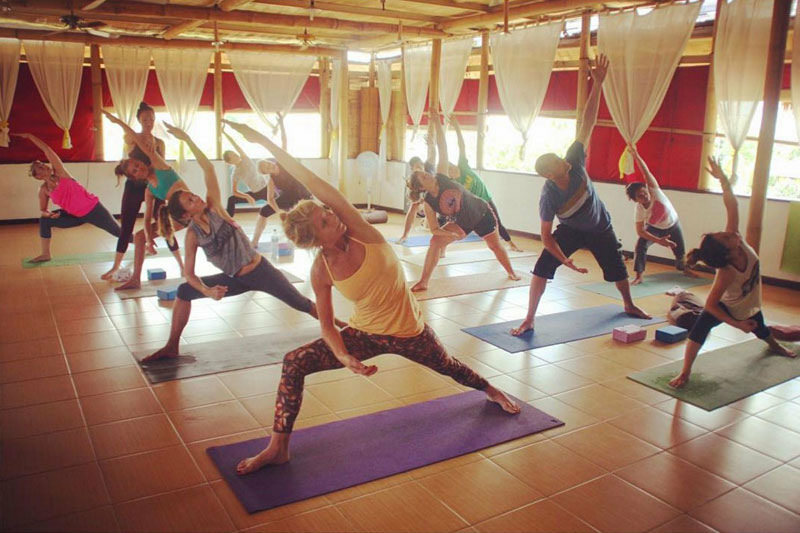 There are also 2 yoga studios providing daily yoga classes you may join, and 3 other studios you may rent (if you intend to host a retreat here), Yoga Barn is the one-stop location that will meet the needs of true blue yoga lovers. 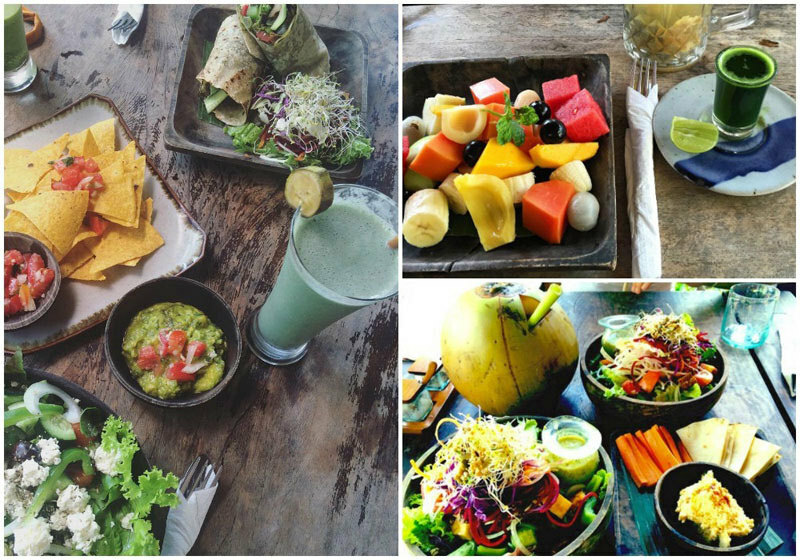 Dining wise, Garden Kafe at Yoga barn offers a variety of healthy food, featuring locally grown produce, living vegan foods, fresh juices, raw snacks & desserts, and a special menus for Detox and Ayurvedic Rejuvenation. The Southern peninsula of Bukit is an interesting mix of amazing cliffside temples and laid-back surfer bars. At The Temple Lodge, you can experience the best of both worlds while also enjoying daily yoga classes. The classes take place in the morning and range from Hatha to Vinyasa Flow. 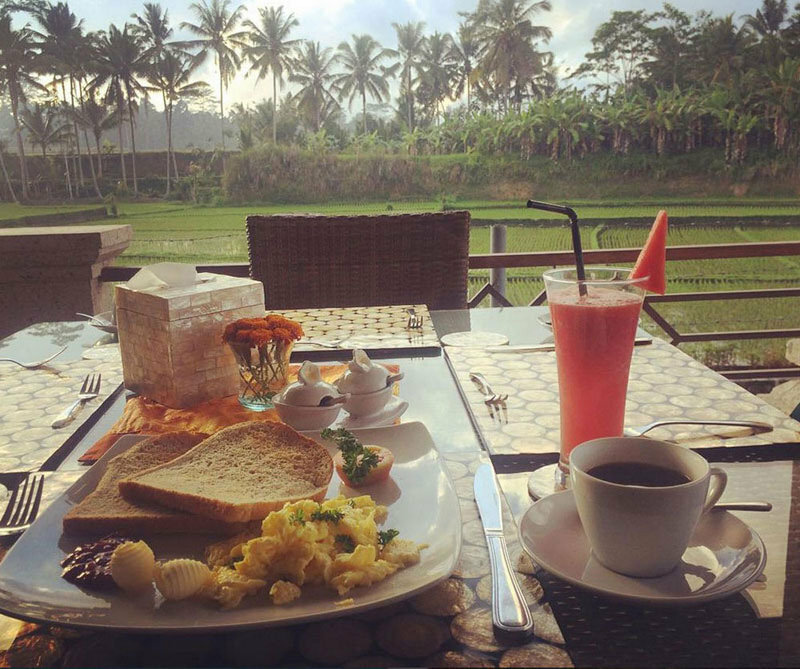 As far as meals go, only breakfast is included in the room price but this should be no problem as the Lodge has its own restaurants (not to mention all the great eateries dotted throughout the area). The menu relies heavily on fresh seafood and local organic vegetables. 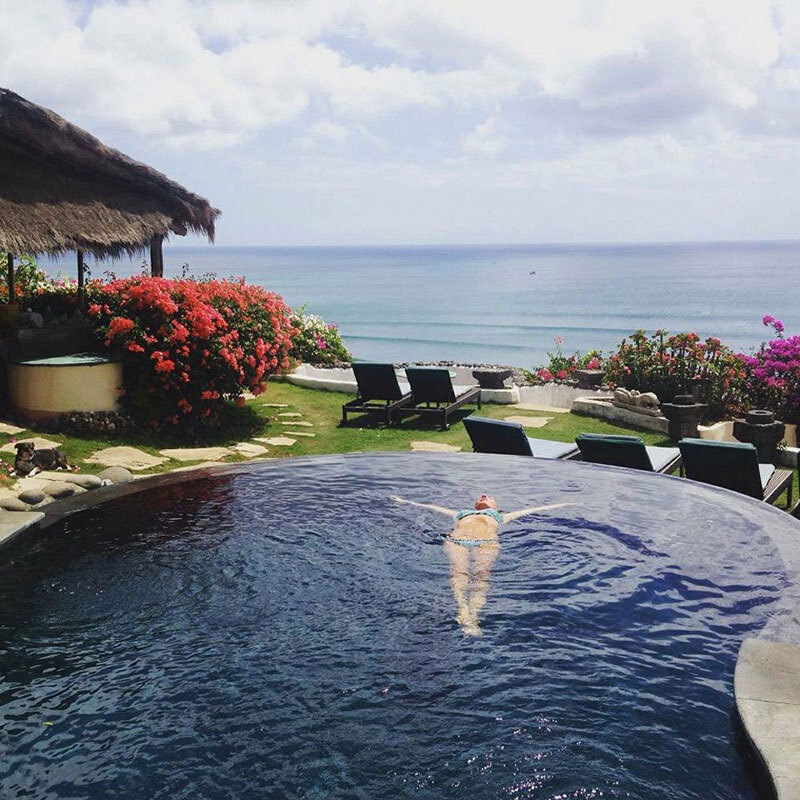 And of course, there’s an amazing pool which offers breathtaking cliffside views out into the ocean. 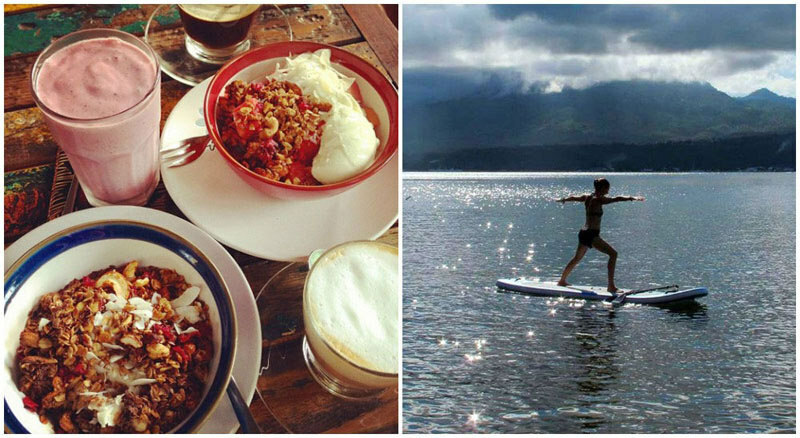 Rates at Temple Lodge include a daily healthy breakfast for all guests as well as the use of gorgeous pool and access to world class surf breaks just around the corner. Daily morning yoga classes welcome yogis of all experience levels. The styles of yoga offered vary from hatha to vinyasa flow. The regency of Tabanan is famous for its emerald green rice paddies which seem to stretch out as far as the eye can see. And that is to say nothing of the mountainsides dotted with temples. Simply put, the views around these parts are nothing short of stunning. Prana Dewi Mountain Resort is the perfect place to truly appreciate all this natural beauty. 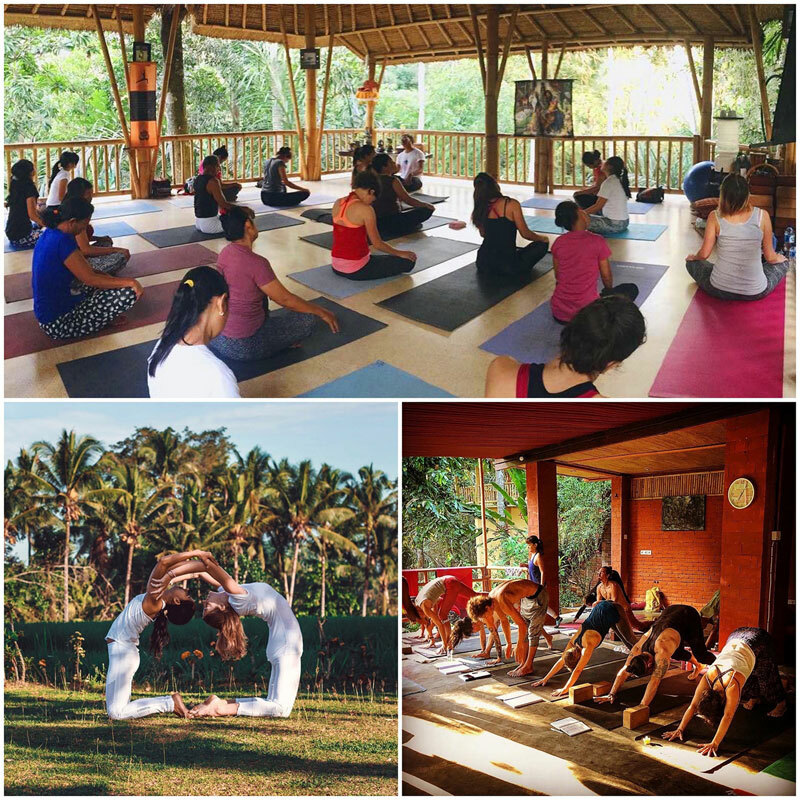 Besides offering yoga and meditation classes, Prana Dewi Resort also gives visitors the chance to explore the surrounding area on guided trekking tours. The hikes include a visit to a mountainside temple, and the resort also has its own restaurant – which serves organic food mostly harvested from the surrounding fields and gardens! 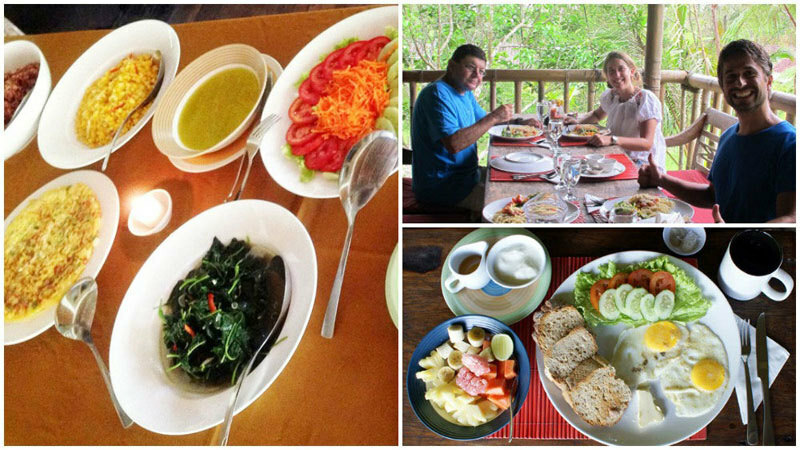 In addition to daily Iyengar yoga, trekking and guided meditation, a 4-night stay at Prana Dewi also includes daily organic meals. The retreat strives to cater to beginners and advanced yogis alike. 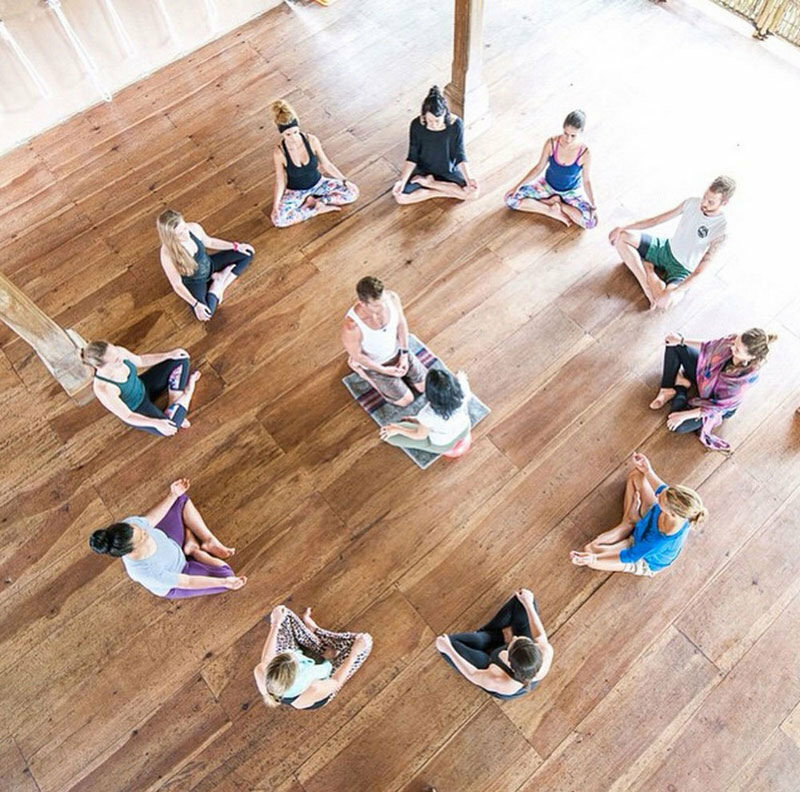 Retreats are held on specific dates, so do make sure to check Prana Dewi’s website for up-to-date info regarding upcoming retreats. Different retreats are offered every year, so please check with the resort for specific rates. 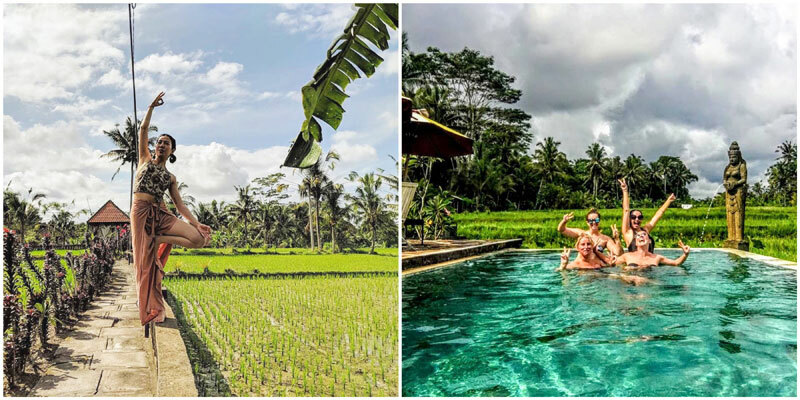 Though it’s sometimes easy to forget in the clamor of Southern Bali, there are still parts of Bali where it really is possible to get away from it all. Abasan Mountain Retreat, one of the two retreats by Gaia Oasis, is just the ticket for those looking to see “the real Bali”. This beautiful mountainside retreat is tucked away in the Northern Coast of Bali, worlds away from the beaten path. The guided classes available can vary from yoga to meditation, and dance and beyond. The retreat is also passionately involved in promoting and preserving local Balinese culture and communities. Guests can get involved in this valuable work by taking part in Gaia Foundation’s volunteer program. 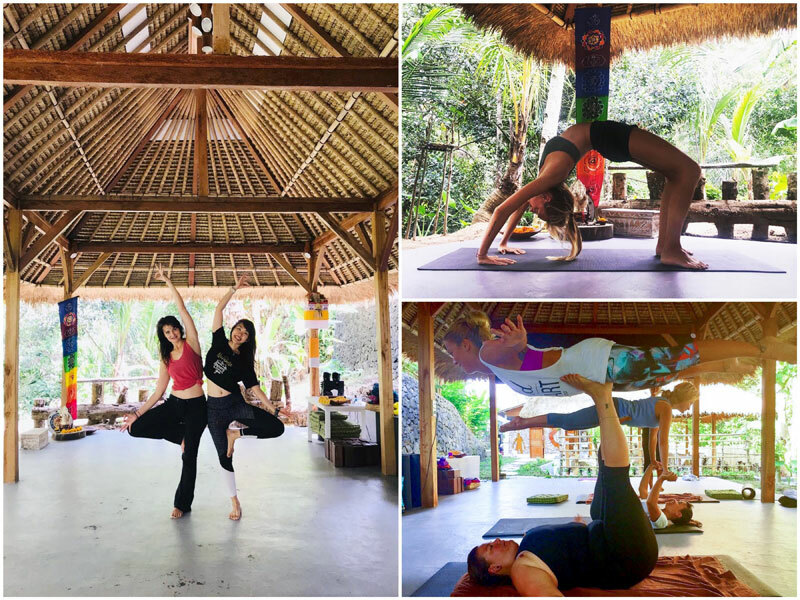 If you’re looking for the yoga getaway with the best of both worlds, Gaia Oasis provides a free shuttle service that runs between Abasan Mountain Retreat, and Pantai Beach Resort! So guests at Gaia Oasis may choose between the beautiful mountainside or refreshing beach views – what a truly lovely way to get away from it all. 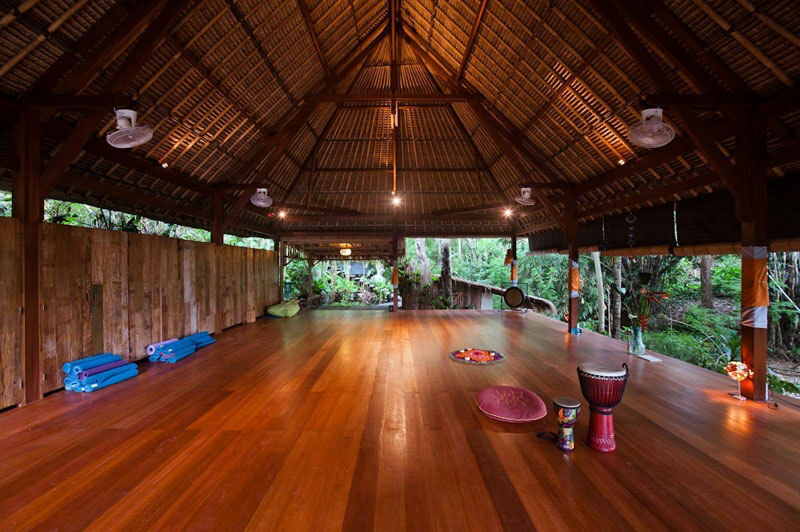 Gaia Oasis offers all guests 5 guided yoga classes a week. The classes vary from yoga to meditation, and dance and beyond and are suitable to practitioners of all levels. A free shuttle service is also available, taking guests between the beach and mountain properties. Guests who opt for the “full board” option are also welcome to tuck into the delicious buffet served three times a day, featuring delicious and healthy vegetarian food. 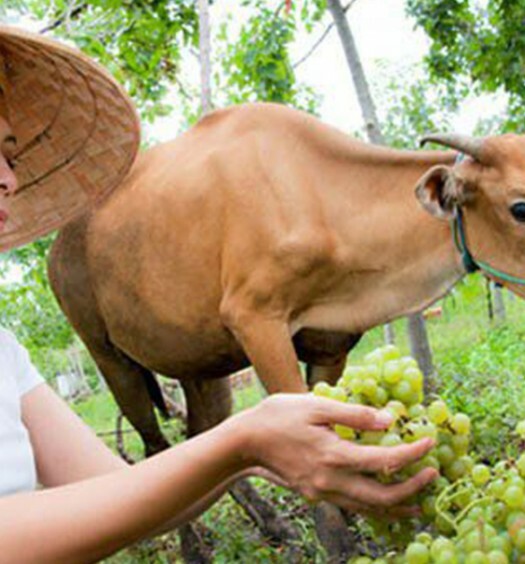 Most of the food offered is sourced from local farms and the retreat’s very own organic garden. 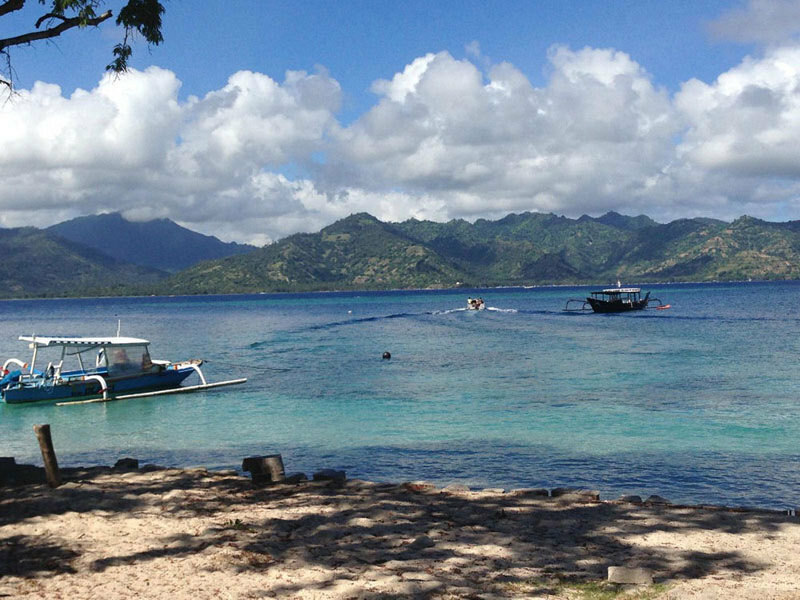 The northern coast of Bali is famed for its as-of-yet unspoiled beaches, great snorkeling spots and dolphins. 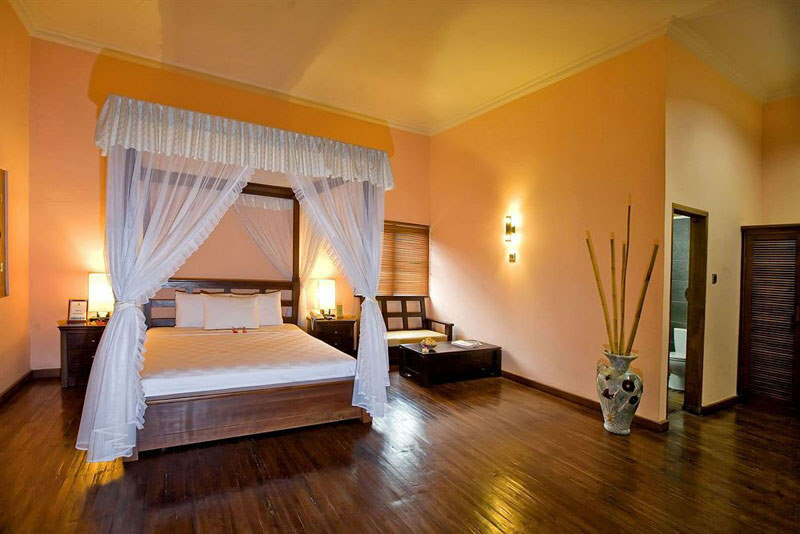 Located in Singaraja, Nibbana Resort & Spa plays all of this to its full advantage. 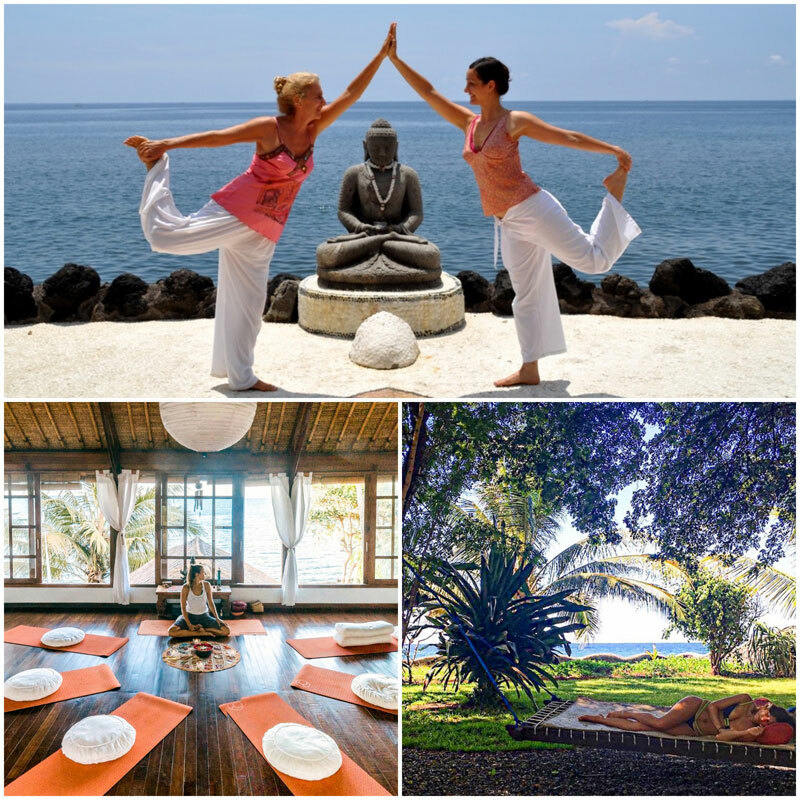 The Resort offers retreats which feature both yoga classes and diving excursions. If you’re lucky enough, you just might catch a glimpse of dolphins on your diving excusion! As Singaraja is a world away from the heavy traffic of South Bali, guests can also explore the beautiful surroundings of the resort by bike. 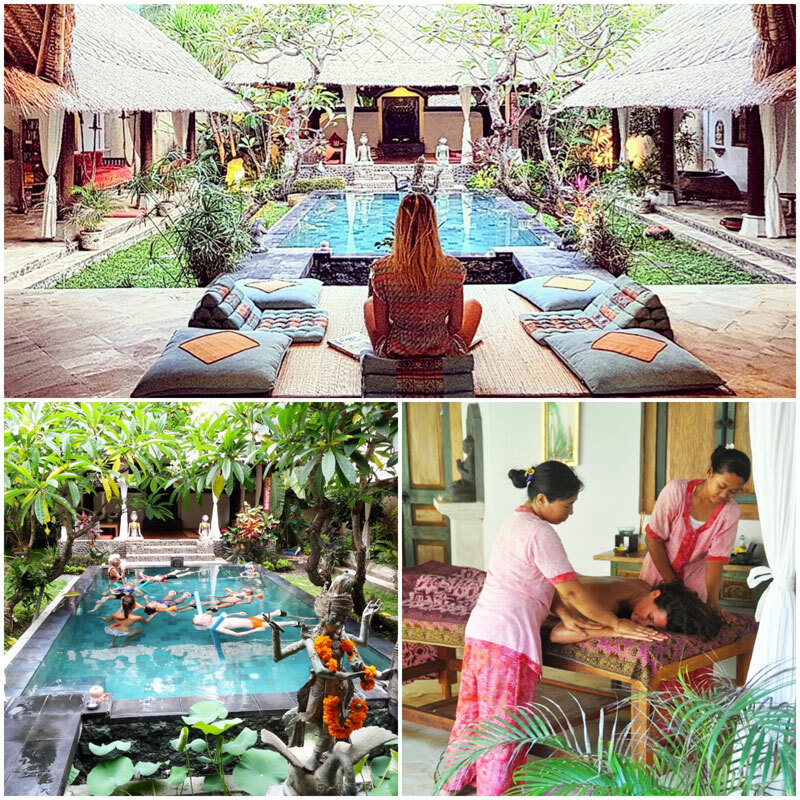 Nibbana has its own spa and also offers Balinese cooking classes for guests. Still, the biggest selling point might just be that stunning pool overlooking the ocean. 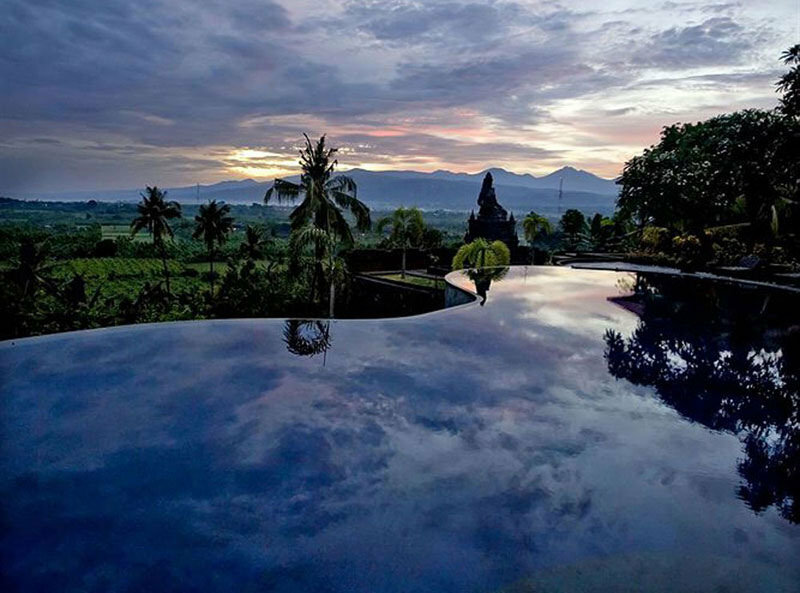 The views from the pool are magical – the kind you can only find in Bali. A 3-night retreat at Nibbana includes daily morning yoga classes as well as a healthy daily breakfast to start your day right, and a diving trip to Menjangan Island. 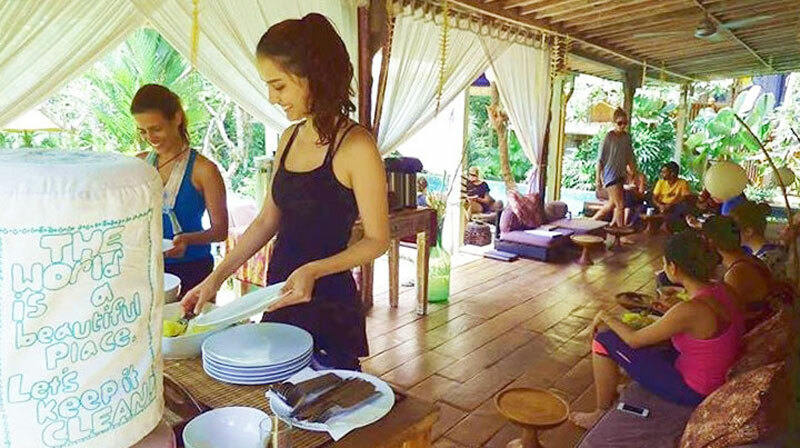 Guests also get to join a Balinese cooking class where lunch is of course included. After that, you may also cycle around the resort and enjoy a one-hour long traditional Balinese massage as part of the retreat package. 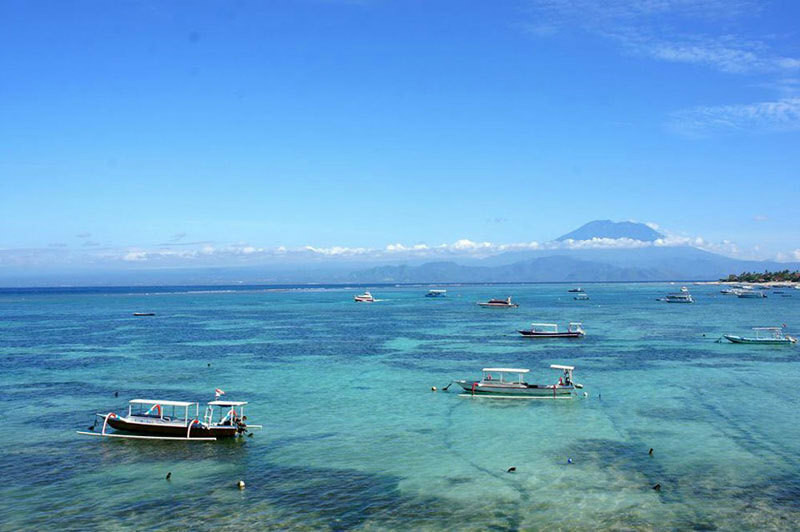 Take a short boat ride on beautiful Gili Air to Gilis, one of the three scenic islands nestled off the coast of Bali’s neighbouring island Lombok. There are no cars on this tiny island, which is just one of the things that makes H20 Yoga & Meditation Center an ideal place to unwind from your busy day-to-day. The address says it all. 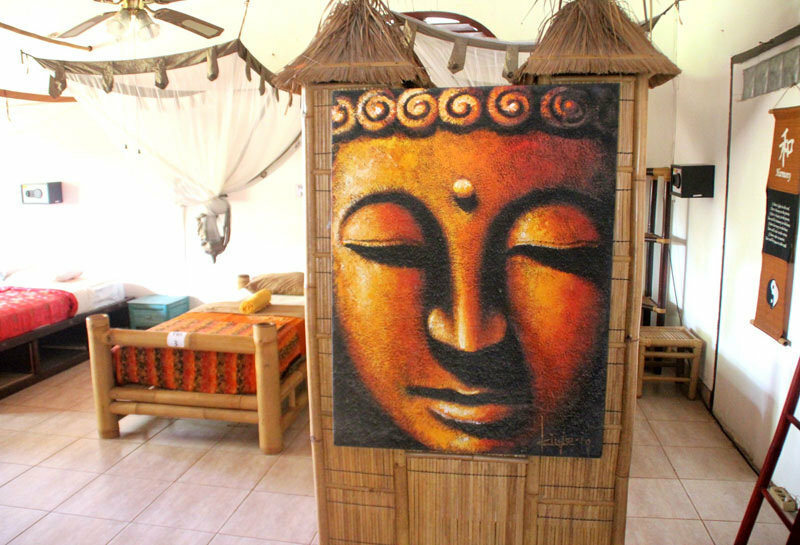 Located on Buddha Way, just a hop and a skip away from the pristine white sandy beach – H2O Yoga & Meditation Center invites visitors not only to reconnect to their inner wisdom, but also to the natural world around them. In practice this can mean anything from snorkeling in the clear blue waters to practicing yoga on the beach! A-7 night “True Nature” retreat at H2O includes daily meditation and yoga classes. 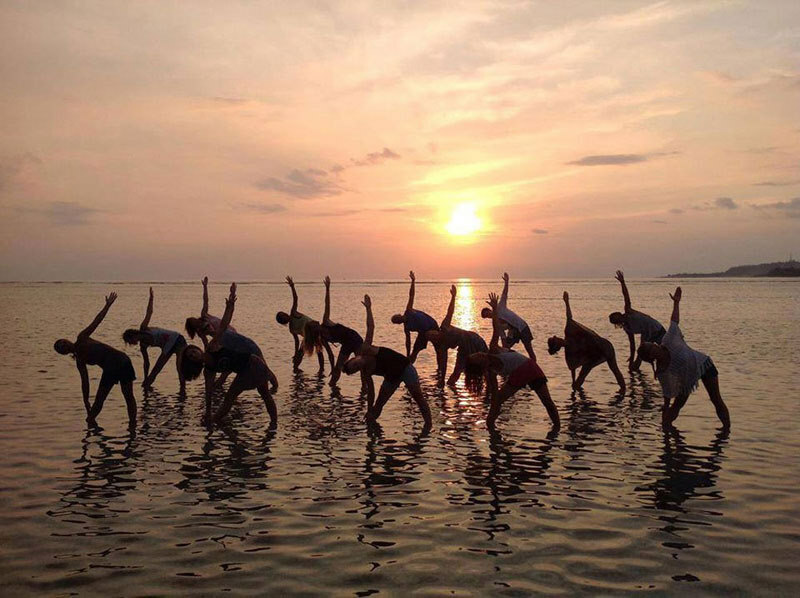 The yoga classes offered are suitable for all levels of experience and feature everything from yoga on the beach to bamboo stick yoga. 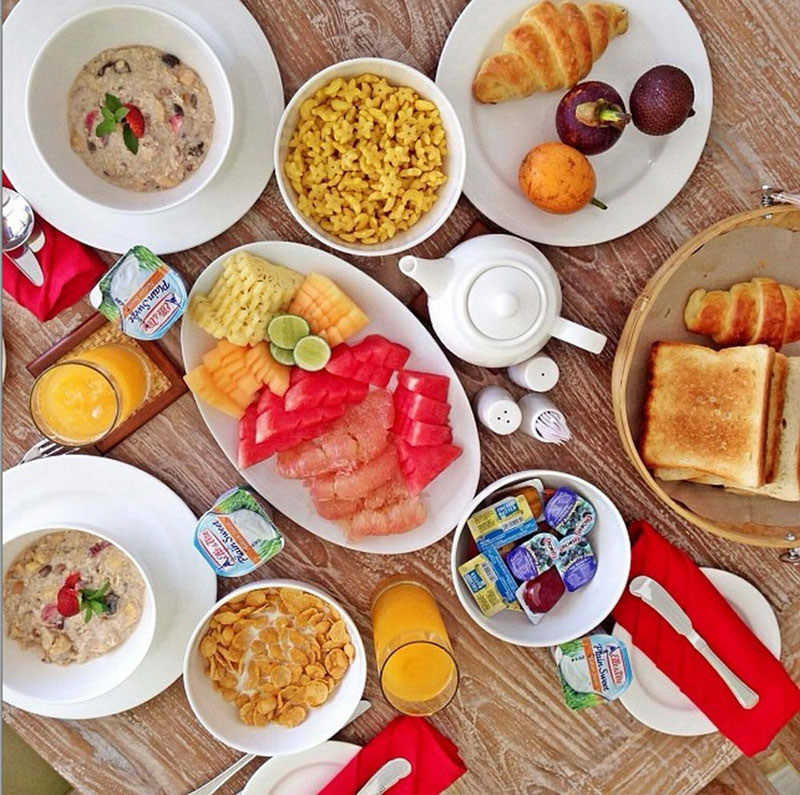 Guests are also treated to a daily breakfast and a healthy, vegetarian dinner. Also included is a day trip to the beautiful island of Lombok for an unforgettable rainforest adventure as well as a snorkeling trip. A fast boat trip to and from Bali is also included in the retreat price. H2O hosts retreats on specific dates, so be sure to check H2O’s website for up-to-date info regarding upcoming retreats. 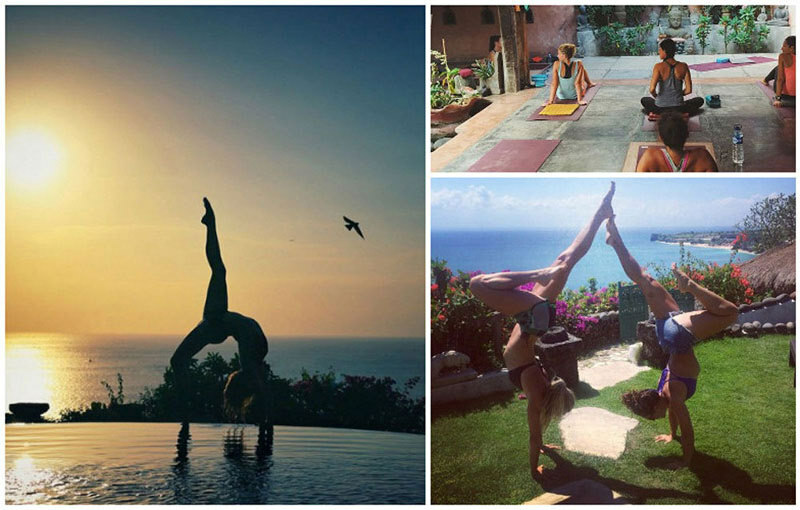 Are there any more Yoga retreats you can recommend? Comment below to let us know! Pia first landed in Indonesia in 2012 and has been going back ever since. 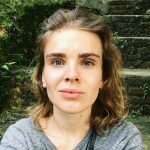 Since then, she’s spent a Christmas driving from Lampung to Lake Toba, stayed in clifftop villas in Bali and tagged along for a rock and roll tour of Jakarta. Pia blogs about the off-the-beaten-path wonders of Bali and Indonesia at coffeeandfrangipani.com.